It was quite an eventful week. During this week, the week of good Friday and the return of the Pessach and the cruxification, the church in Paris that claims to have the remains of the cross of Jesus and the crown of thorns as a relic, burned. This church is dedicated to Notre Dame on the Ile de la Cite, so to “our lady”. I do not know if this church is dedicated to a virgin Mary or Mary Magdalene, like Chartres, as some of the recent mention, in case there was a former Temple of Isis and Jupiter there, it is most likely a place dedicated to the dark goddess, so to Mary Magdalene. The Ile once was settled by celts, then romans, Lutetia, and later became the first capital of the Merovingian. Jacques de Molay died there on the pyre, famous for his curse to king and pope. What hardly anyone in the media had noticed, at the same time with the Notre Dame the mosque in Jerusalem on the Temple Mound was also in flames, in addition to one of the oldest churches in Ukraine a few hours earlier. The Ukraine – especially Crimea – once used to be one of the guardians of Jerusalem as it provided armies and guards for the safety of pilgrimage routes and security in Jerusalem. As already mentioned, all of this happened during the Holy Week, when we commemorate Passover with the Crucifixion of Christ. And just this week, for the Christian world on Good Friday, for the Jewish on the eve of Passover, a powerful full moon takes place. I emphasize it this way, as the story of the temple, where the curtain was torn apart accompanied by darkness and an earthquake around the time Jesus died, was thought to be a solar eclipse, which means, a full moon. So I also checked curiously, if it would be about 15.00 clock in Israel (as this is the time said) – and the full moon will be around 15:12. It will not be in darkness, as this time there will be no eclipse, but the coincidence of the full moon on Good Friday at almost the same time as mentioned in the Bible, with all the events of this week is remarkable. 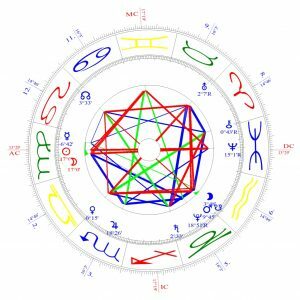 The horoscope of the full moon shows very dominant energy lines that form a slightly shifted cross in the cardinal signs of the horoscope. One of these arms holds the northern node on one side alone, while on the other side Saturn and Pluto join the descending node. The other pair of opposites shows Uranus in wide conjunction with the Sun (wide as it is in an other sign, but within 3 degrees) – with the full moon opposition on the other side. Those who follow my articles about the Dreamspell know that I often describe the Dreamspell as a cosmic phone, communicating in our solar system solely through our sun, as it holds the second ray of love / wisdom, and our solar system is a love / wisdom system. All the energies that we emit or create are soaked in or transformed by the sun with love / wisdom, something depriving it in the vastness of our current state (which we may see symbolically as coronal holes). Uranus in conjunction with the sun opens this communication to a hyper-band with incredible range and speed. Since Uranus symbolizes electricity on the outside world, and the Kundalini on the inner energetic, this time may be accompanied by increasing interferences, power outages, strong energy shifts on inside and outside, over-electrification and thus over-information also on a nervous system level. (mind, that this day is also a portal day in Dreamspell, resonant warrior). Accidents due to misperception and „too fast-going events“ are possible. On the positive side, perceptions, opening winders of perception and inner, cosmic senses are possible. All of this may be accompanied by either exhaustion (when the body tries to accept the over-energizing) – or being wakefulness at night (when the body uses the energy completely to process the incoming). However, Saturn and Pluto in Capricorn at the southern node speaking their own language. in earlier articles (around 2007/2008) I described that Saturn is the ruler of Capricorn, both mundane and esoteric, yet hierarchically Venus is the ruler of Capricorn, and thus the creative impulse of the manifestation of the energy into solidification. Energetically, this may mean that Saturn wants to illuminate matter differently. Saturn is a planet of the third ray of Active Intelligence, and stands eg for the higher mental body of humanity, and the energy of the planet Earth, since Earth is also a planet of the third ray. Saturn in Capricorn thus sets again and again an impulse that we, as humanity, should re-think the forms we create, adapting them to a higher level of value, in active intelligence. Active intelligence also means „networking“ – the working together in groups or levels of communication that facilitate cooperation and living together on Earth. Saturn symbolizes building a higher mind, just as cathedrals stand for experiencing an elevating structure. However, Venus, as the ruler of Capricorn, says that the ultimate impulse to manifestation comes from the levels of light, femininity, sound, and the harmony of creation, wellbeing. Venus as 5th ray planet also symbolizes „right human relationships“; the right way of dealing with each other. Venus is the planet of the “new Age” –emphasizing that we change our interconnections with each other towards higher values. Venus is the little sister of Sirius, so the influx of Sirian energy through Venus is one of the initiation streams Earth is in. Pluto in Capricorn now ”shreds” everything that has become too solid, wherever structure or matter, form, building no longer serve this ideal or can no longer withstand it. In previous articles about Pluto in Capricorn, I quoted Jeff Greene that described Capricorn as a „yearning for the loss of control”. With Pluto in Capricorn, the structure that may have become too rigid, with people that may not adapt their thinking and mind towards higher values and cooperation, may be shredded in that energy of “loss of control over a situation”. Pluto downsizes – especially at the southern node that represents the past – everything that is no longer useful, too firm, too rigid, no longer open towards adaption. I do not want to equal the burning of 3 churches, one Muslim on Jewish ground, one Christian and one Orthodox, with this energy, because too many historical and geomantic issues add to the situation and in my view it is a bit too early to describe a clear picture. Geomantically, the site is overburdened by the history and association with the Templars, and the ISIL attacks in Paris were done as a crusade revenge on a Friday the 13 th, relating to the Templars too. Our previous communication with the Sun in recent years and decades also led to cosmic responses that humanity refuses to be aware of, because some do not like to be aware of the impact we all have through the communication with the Sun. The impact, emotions or technology have to this communication. In my own view, it is not just the feminine that fights back, or the overburdening of the structure of the catholic church dealing with the female energy or sexuality, or that many (most?) buildings are no longer adaptive to the unfolding morphing energies of the moving earth or may be able to buffer the negative emotional impact of humanity. also too many unfolding power or dragon lines, lines of elemental forces awaken and also run across or below sacred sites, something that was consciously taken as place for buildings like cathedrals or churches. However, it is true that this event, similar to 9/11, made an impression on psychological time in multidimensional layers and levels outside the physical, the event itself and this impact already changed people. One of the most balming and beautiful energies was the singing of the people, who sang the songs the catholic church had created and dedicated to the female energy of Mary, honoring the building and what it meant during the fire, saying goodbye to it in love and awareness. The flames were soaked in the emotion and sound of these songs and energy, an expression of Venus, the hierarchical ruler of Capricorn. A homage to the place, and perhaps also the original impulse that led to the construction of the cathedral. This very special energy will lead to many types of flowers in many sacred places on Earth, a beautiful seed done. This may be represented by the aspect of Lilith and Venus. Lilith and Venus are in a Confinis aspect to each other, the Confinis aspect often leads to irritation, since there seems to be a resonance, but the tone has a slightly different note. For example, one thinks you hear an octave „C“ – ie. the same tone on two levels, but there are two tones, slightly shifted, like “C” and the higher D for example. A similarity, yet slight dissonance because one tone of the two is already one step ahead of the higher-level harmony. The full moon horoscope also shows conjunction of Mercury and Chiron – communication can be painful, or reveal wounds, or – very clearly visible – are an attempt to obscure wounds and disabilities. Lilith Venus together with Mercury-Chiron may be a sign for irritation in communication, due to the dissonance amplified. It may seem one may have the same energy or thought, but the other may be on a higher plane, slightly one step ahead. Jupiter is in a wide square to Venus, which may result in an over-abundant tendency to beauty, which, however, also no longer has a higher impulse, but is „phased out“. The excess energy on this level changes from magnetic overflow to the full electrification by Uranus/Sun, which can be an overboarding impulse In the sudden energy shift. So as one may have noticed, there is a lot of energy. and the pressure on all levels still points to humanity and Earth – and the demand to deal differently with structure and substance. At the same time, however – all this takes place on Good Friday, at a cross-reference with a point in „time“ mentioned in the Bible, the time then the veil / curtain in the temple ripped apart. As there is no eclipse, no darkness may come – yet I expect an increase in earthquakes as soon as the sun has entered Taurus and thus joins Uranus at the elemental level of “earth”. Energetically, this already starts when the full moon is in opposition to Uranus in Taurus which will be during the evening / Night of Good Friday – and the actual release may takes place from April 22nd on. I would therefore expect stronger earthquakes within the next few weeks, the time of Sun in Taurus, as communication with the Sun really reaches Earth and Humanity. This also goes along with the warning of accidents and disasters, as already described in March, well into the year, i. until at least July, as the topics are re-activated at the summer solstice. May the stars shine brightly for you, and may your own inner star shine your way. PHASE 30 (ARIES 29-30°): A DUCK POND AND ITS BROOD. KEYNOTE: The realization of natural boundaries. After the preceding symbol this may seem anticlimactic. What is shown here is that every form of activity has its limits, and that even the consciousness that has been able to get a glimpse of universal order has to bring down to its own „karmic“ field of operation the message of harmony it has heard inwardly. Peace and inner contentment with one’s essential destiny (dharma) is required to meet the everyday world. The mystic may experience flights of imagination and transcendent vision, but he must return to the concrete earth and to his task in his social environment. Extensive as the latter may seem it is still very small compared to the galactic field; it is indeed a duck pond compared to the ocean. But it is there that the substance for concrete action has to be found, and every effective activity has to be focused; thus the boundaries imposed by the very nature of this activity have to be consciously accepted. This is the last stage in the last five-fold sequence related to the second scene, characterized by „Potency.“ It leads to the third scene, whose Keyword is „Substantiation.“ Potency has to become substantiated – it has to mate with substance – in order to be effective power. Power must accept the principle of FOCALIZATION. PHASE 210 (LIBRA 29-30°): THREE MOUNDS OF KNOWLEDGE ON A PHILOSOPHER’S HEAD. KEYNOTE: The fulfillment of man’s power of understanding at whatever level of existence the person operates. A true philosopher is a man who is able to „understand,“ not merely „know,“ the processes of life as he comes to experience them directly. He is the man of wisdom, different indeed from the man of science; for while there must be knowledge before understanding, knowledge alone can be both barren and destructive of wisdom. This peculiar symbol refers of course to „phrenology,“ which is usually considered a pseudo-science, but may provide significant indications. Number 3 always indicates a state of completion. The symbol implies a fulfillment of understanding, which obviously has nothing to do with academic degrees or the writing of successful treatises on abstract concepts. Es war eine sehr ereignisreiche Woche. In der Karwoche brannte in Paris die Kirche, die von sich sagt, Reste des Kreuzes Jesu und der Dornenkrone als Reliquie aufzubewahren. Diese Kirche ist Notre Dame auf der Ile de la Cite, „unserer“ Frau geweiht. Ich weiß nicht, ob diese Kirche Maria Magdalena geweiht ist, so wie Chartres, oder der jungfräulichen Maria. Ich habe in den letzten Tagen oft in anderen Artikeln gelesen, dass sich ein Isis -oder Jupiter-Heiligtum unter der Kirche befand, was auf eine Weihung zur Maria Magdalena schließen lässt. Die Ile war keltisch besiedelt, Lutetia, und wurde später die erste Hauptstadt der Merowinger. Jacques de Molay fand hier seinen Scheiterhaufentod, berühmt auch sein Fluch zu König und Papst. Was kaum jemand in den Medien wahrgenommen hatte, gleichzeitig mit der Notre Dame brannte die Moschee in Jerusalem auf dem Tempelberg, zusätzlich dazu ein paar Stunden zuvor in der Ukraine eine der ältesten Kirchen. Die Ukraine – vor allem die Krim – war in früherer Zeit einer der „Hüter Jerusalems“ – und stellte zur Sicherheit der Pilgerwege und der Sicherheit in Jerusalem Heere und Wächter ab. Nun geschah all dieses, wie bereits erwähnt, in der Karwoche, in der wir das Pessachfest mit der Kreuzigung Christi gedenken. und just in dieser Woche findet für die christliche Welt an Karfreitag, für die jüdische am Vorabend des Pessach, ein kraftvoller Vollmond statt. Ich betone es in dieser Art, da die Geschichte vom Tempel, in dem der Vorhang durch eine Finsternis und ein Erdbeben riss, als Jesus starb, vermutlich zu einer Sonnenfinsternis stattfand, die ja einen Vollmond voraussetzt. Also schaute ich auch neugierig, ob es ca 15.00 Uhr in Israel sein würde, der Vollmond wird dort gegen 15:12 sein. Es wird zwar keine Finsternis sein, doch das zeitliche Zusammentreffen des Vollmondes an Karfreitag fast zur gleichen Uhrzeit wie in der Bibel erwähnt mit allen Ereignissen dieser Woche erstaunt ein wenig. Der Vollmond selbst zeigt sehr dominante Energielinien, die ein leicht verschobenes Kreuz in den kardinalen Zeichen des Horoskopes bilden. Eines dieser Arme hält auf einer Seite den aufsteigenden Mondknoten alleine, während auf der anderen Seite Saturn und Pluto sich zum absteigenden Mondknoten gesellen. Das andere Gegensatzpaar zeigt Uranus in weiten Konjunktion mit der Sonne (weit, da in einem anderen Zeichen, doch innerhalb 3 Grad) – mit der Vollmondopposition auf der anderen Seite. Wer meinen Artikeln über den Dreamspell folgt, weiß, dass ich oft den Dreamspell als ein kosmisches Telefon beschreibe, wir kommunizieren in unserem Sonnensystem ausschließlich über die Sonne, da sie den zweiten Strahl der Liebe/Weisheit birgt, und unser Sonnensystem ein Liebe /Weisheitssystem ist. Alle Energien, die wir Formen oder erschaffen, werden von der Sonne mit Liebe/Weisheit durchtränkt oder von ihr umgeformt, etwas, von dem sie sich manchmal etwas entkräftet zeigt (coronal holes) Uranus in Konjunktion zur Sonne öffnet diese Kommunikation zu einem hyper-Band mit unglaublicher Reichweite und Geschwindigkeit. Da Uranus für Elektrizität im außen, und die Kundalini im inneren des Körpers steht, kann es verstärkt zu Störungen, Stromausfällen, starken Energieschüben im innen und außen, Überelektrifizierung und damit einer Überinformation auch auf nervlicher Ebene kommen. Unfälle aufgrund falscher Wahrnehmung und „zu schnell ablaufenden Ereignissen“ sind möglich. Auf der positiven Seite sind Wahrnehmungsschübe, Schübe in der Öffnung von Wahrnehmung und inneren, kosmischen Sinnen, möglich. Damit einher geht entweder Erschöpfung (wenn der Körper sich mit der Überenergie abzufinden versucht) – oder ein Aufgedrehtsein bis hin zu Wachzuständen in der Nacht (wenn der Körper die Energie völlig zum verarbeiten einsetzt). Saturn und Pluto in Steinbock am absteigenden Mondknoten sprechen jedoch ebenfalls eine eigene Sprache. 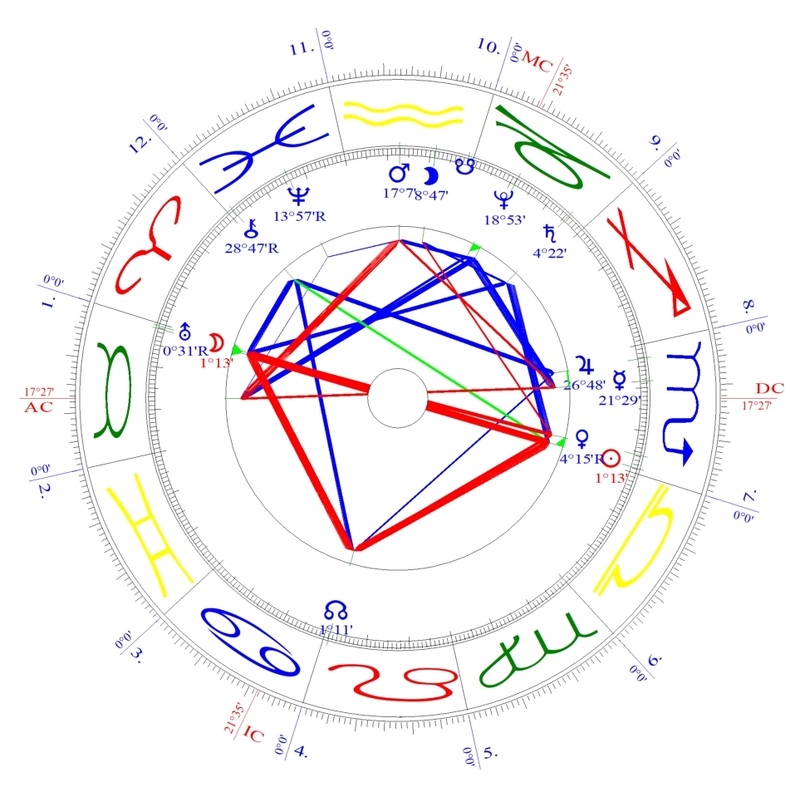 Ich habe in früheren Artikeln (um 2007/2008) geschildert, dass Saturn sowohl auf weltlicher als auch auf esoterischer Ebene der Herrscher von Steinbock ist, hierarchisch ist Venus die Herrscherin von Steinbock, und damit der Schöpfungsimpuls der Manifestation der Energie in die Verfestigung. Energetisch bedeutet dies, dass Saturn die Materie anders durchleuchten möchte. Saturn ist ein Planet des 3. Strahls der aktiven Intelligenz, und steht u.a. für den Mentalkörper der Menschheit, und die Energie des Planeten Erde, da die Erde ebenfalls ein Planet des 3. Strahles ist. Saturn in Steinbock gibt also immer wieder den Impuls, dass wir als Menschheit die Formen, die wir schaffen, überdenke, sie anpassen. Sie dem Leben auf der Erde anpassen, in aktiver Intelligenz. Aktive Intelligenz zB. bedeutet auch „Networking“ – das Zusammenfügen zu Gruppen oder Kommunikationsebenen, das eine Zusammenarbeit und ein Zusammenleben auf der Erde erleichtert. Saturn steht für das Erbauen eines höheren Denkvermögens, so wie Kathedralen für das Erfahren einer Erhöhenden Struktur stehen. Venus als Herrscher von Steinbock jedoch sagt – dass ultimativ der Impuls zur Manifestation aus den ebenen des Lichtes, der Weiblichkeit, des Klanges und der Harmonie der Schöpfung, der Wohlproportionen kommt. Venus steht auch für die „rechten menschlichen Beziehungen“ d.h. des richtigen Umgangs der Menschen miteinander. Pluto in Steinbock nun schreddert alles weg, was sich zu stark verfestigt hat, überall da, wo die Struktur und Materie, Bauten, Gebäude, diesem Ideal nicht mehr dienen oder ihm nicht mehr standhalten. In den früheren Artikeln zu Pluto in Steinbock ging ich darauf ein, dass Jeff Greene den Steinbock als „Sehnsucht nach Kontrollverlust“ beschrieb. Mit Pluto in Steinbock wird die zu fest gewordene Struktur, die Menschen nicht von sich aus einem höheren Streben und der Zusammenarbeit anpassen, einfach bis hin zum Kontrollverlust geschreddert. Pluto macht – vor allem am absteigenden Mondknoten – klein, was nicht mehr dienlich ist, da zu fest geworden, zu rigide, nicht mehr für etwas neues angepasst. Ich möchte den Brand von 3 Kirchen, einer muslimischen auf jüdischem Grund, einer christlichen und einer orthodoxen, nicht mit dieser Energie gleichstellen, da zu viele historische Themen zusammenlaufen und noch kein klares Bild ergeben. Geomantisch ist der Ort, auch durch die Geschichte und Verknüpfung mit den Templern, und den ISIL Attentaten in Paris als Kreuzzug-Rache an einem Freitag den 13 zu sehr überfrachtet, unsere frühere Kommunikation mit der Sonne in den letzten Jahrzehnten hat auch zu kosmischen Antworten geführt, die die Menschheit sich zu lesen weigert, da sie das Konzept der kosmischen Kommunikation über die Sonne nicht wahrnehmen möchte. Es ist aus meiner Sicht nicht nur das weibliche, dass sich wehrt, oder die Überfrachtung der Struktur der Kirche, oder dass viele (die meisten?) Bauwerke nicht mehr für die sich entfaltenden Energien der sich bewegenden Erde angepasst sind. Zu viele andere Kraftlinien wirken hinein. Richtig jedoch ist, dass dieses Ereignis, ähnlich wie 9/11, einen Eindruck in der psychologischen Zeit gemacht hat, d.h in dimensionsebenen außerhalb des physischen, die schon jetzt die Menschen verändert haben. Der Brand selbst war begleitet von Gesängen der Zuschauer, die dem Gebäude die Lieder vorsangen, die die Kirche im Laufe der Zeit zu Ehren des weiblichen verfasste. Die Flammen waren also durchtränkt von der Emotion und dem Klang der Venus, des hierarchischen Herrschers von Steinbock. Eine Ehrerbietung für den Platz, und vielleicht auch dem originären Impuls, der zu dem Bau der Kathedrale führte. Die Energie die dadurch bereitgestellt wurde, wird, zusammen mit dem Ereignis, zu Blüten vieler Art an vielen Kraftorten auf der Erde führen. Das Vollmondhoroskop weist darüber hinaus eine Konjunktion von Merkur und chrion auf – Kommunikation kann schmerzhaft sein, oder Wunden aufdecken, oder – sehr deutlich sichtbar – den Versuch darstellen, Wunden und Unfähigkeiten zu verdecken. Lilith und Venus befinden sich in einem Confinis Aspekt zueinander, der Confins Aspekt führt oft zu irritationen, da es einen Gleichklang zu geben scheint, jedoch hat ein Ton eine leicht andere Note. Man denkt z.B. man hört eine Oktave „C“ – dh. den gleichen Ton auf zwei Ebenen, doch es sind zwei Töne, leicht verschoben. C und das höhere D zum Beispiel. Eine Ähnlichkeit, und doch leichte Dissonaz. da ein Ton von den beiden schon einen Schritt weiter als der Gleichklang auf höherer Ebene ist. Zusammen mit Merkur-Chiron kann dies zu Irritationen in der Kommunikation kommen, die Dissonanzen (auch zum weiblichen) verstärkt, so dass man irritiert feststellen könnte, man dachte, man hätte die gleichen Energien, doch einer von beiden – hier das weibliche – ist schon irgendwie einen Schritt weiter. Jupiter befindet sich in einem sehr weiten Quadrat zur Venus, was eine überbordende Tendenz zum Schönen zur Folge haben kann, die jedoch ebenfalls nicht mehr die Höchste Spannung hat, sondern am „auslaufen“ ist. Die überschiessende Energie wandelt sich auf dieser Ebene von der magnetischen Überbordung zur Voll-elektrifizierung durch Uranus mit Sonne, die alles überschatten kann. Es ist also viel Energie da. und der Druck auf allen Ebenen zeigt immer noch auf die Menschheit und die Erde – und die Forderung, mit Struktur und Substanz anders umzugehen. Gleichzeitig jedoch – findet all dieses am Karfreitag statt, zu einem „Uhrzeit“punkt, der in der Bibel erwähnt ist, als der Zeitpunkt, an dem der Schleier/Vorhang im Tempel riss. Da es keine Finsternis ist, wird keine Dunkelheit kommen – ich rechne jedoch mit einer Zunahme an Erdbeben, sobald die Sonne in Stier gegangen ist, und damit auch auf Elementeebene sich mit Uranus verbindet. Energetisch beginnt dies wenn der Vollmond in Opposition zu Stier geht, d.h. gegen Abend des Karfreitags – und die eigentliche Auslösung erfolgt vrs. am 22.4.. Ich würde daher mit stärkeren Erdbeben innerhalb der nächsten Wochen, der Zeit von Sonne in Stier, rechnen, da die Kommunikation mit der Sonne die Erde und die Menschheit nun wirklich erreicht. Einher geht dies ebenso mit der Warnung vor Unfällen und Unglücken, wie bereits im März geschildert, bis weit in das Jahr hinein, d.h. bis mindestens Juli, da die Themen zur Sommersonnenwende neu aktiviert werden. Mögen die Sterne Euch leuchten, und Euer eigener innerer Stern Euch den Weg weisen. A true philosopher is a man who is able to „understand,“ not merely „know,“ the processes of life as he comes to experience them directly. He is the man of wisdom, different indeed from the man of science; for while there must be knowledge before understanding, knowledge alone can be both barren and destructive of wisdom. This peculiar symbol refers of course to „phrenology,“ which is usually considered a pseudo-science, but may provide significant indications. Number 3 always indicates a state of completion. The symbol implies a fulfillment of d understanding, which obviously has nothing to do with academic degrees or the writing of successful treatises on abstract concepts. This fifth stage symbol is the last of the Libra series: Understanding and wisdom develop in terms of the life of community and through experiences provided by interpersonal and group relationships. Cultural factors are always involved, even though true wisdom transcends cultural values and is rooted in the essential nature of Man. What is at stake here is A HOLISTIC APPROACH TO KNOWLEDGE, based on universals. March 4th – 5th saw the reaching of the center of the middle column in Dreamspell. This year, the energy of the center and the portal days that follow are in alignment with the newmoon – full moon – and the equinox. Therefore I like to take a look on the energies in kind of blending them together. On March 6th the new moon takes place between 15 – 16 degrees Pisces. The horoscope also shows a Uranus at 0 degree Taurus. Uranus entered Taurus in the past days and it is there to stay. Pluto and the southern node start to approach each other, slowly joined by Saturn. All of them are in an orb of 4 degree, with Pluto in half—sum of the distance Saturn-Node. So it starts to act as a Transfer of light aspect, as a stellium of planets with a wider range, but close together therefore connected through one or more planets on the “inner” is called in astrology. The New Moon is on Kin 132, the yellow lunar human. The lunar tone, in the middle of the Dreamspell, refers to the polarity and of the duality of opposing forces, a human may find itself in, while being in the middle of the cosmic in- and outbreath of energies. PHASE 346 (PISCES 16°):IN THE QUIET OF HIS STUDY A CREATIVE INDIVIDUAL EXPERIENCES A FLOW OF INSPIRATION. KEYNOTE: Reliance upon one’s inner source of inspiration or guidance. In this last scene of the great ritual of cyclic existence we are dealing with various aspects of the process that enables man to „con-firm,“ formulate and perpetuate the original creative impulse which has become self-actualized in a myriad of ways throughout the cycle, short or long as the cycle may be. This first symbol strikes the keynote of truly significant creative processes: their source is above, beyond, but also around the individual creator. The inspiration, original and individual though it may be, is given a form which is conditioned by the cultural, social and religious background of the creative person. In a sense, every genius merely records an answer to the needs of his time. The hands that write, play an instrument, or mold a plastic material are his own; the urge or drive back of the flow of inspiration has arisen in the vast collective mind of Man. The individual aspect of the creative process is emphasized as is the individual’s need for concentration and at least inner quiet. He must have faith in his own SUBJECTIVE STRENGTH. The task is set, as this creative flow from the cosmic center pours into the collective and the individual. Yet, how it can be set into motion on this collective and individual level can be seen through the horoscope. The New moon is calculated for Europe in Universal Time / GMT. 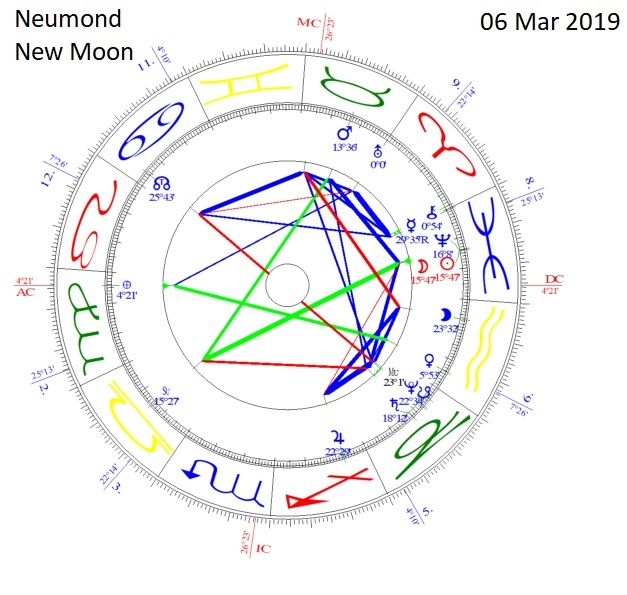 Europe sees this New moon in the 7th house of partners, close to sunset. Neptun and retrograde Mercury are joining as well as Chiron, that entered the Aries sign. For Europe this may mean, that right now may be the right time to evaluate negotiations and decisions, it may even be a good time to turn all negotiations around in making other decisions. With Neptun as the ruler of the oceans, it may also indicate illusions or veiled issues regarding the oceans or the borders that are around the countries. Some issues may dissolve into nothing, while others may need really be taken care of. My inner raises the question of Trade (mercury) tax boundaries, shipping agreements, ferry regulations, so the issues regarding “meeting each other and getting in contact with each other through trade” not really worked through. Also, even if it was not mentioned in the public or tabloid papers, I guess that crude oil and gaz is a remaining unsolved issue. Also on the collective we see now Uranus in Taurus. Taurus, in short, is a symbol for self worth, abundance and ressources. Values and Value systems. The Bull itself as a symbol rules the stock markets all over the world. Taurus is fix earth, so rock solid. Uranus entering Taurus means, that the rock solid earth is shaken, literally as well as symbolically. Uranus in Taurus to this moon may indicate, that the individual has to find the ressources (Taurus) that are lying in the individual creataivity (Uranus). For the whole 7 years of Uranus in Taurus, it may mean, that the Kundalini rising process in the body now has to emerge in a cleansed throat chakra (Taurus) – in a new sound therefore as well as a new expression ofcreativity, while the rock solid soil that used to carry the self worth may be challenged. With Pluto in Capricorn, this “rock shaking” aspect is exponentiated, as the hidden longing of Capricorn of loss of control is met with a transformation up to the very core of the issue. Pluto is shaving through each onion layer structure an individual as well as earth has erected. Where Uranus is challenging the layers of abundance and ressources, we may experience a re-evaluation of ressources one Earth as a whole as well as our creative abilities in the individual. with Pluto in Capricorn we may see the shredding of the structure, a collective has given itself. Shredding the structure while at the same time there is a loss of control ( value) of ressources may turn societies and economies upside down. This may come to a deeper layer after Saturn faced the southern nodes and joins Pluto (January 2020). This is at its best an incredible chance for new technologies (Uranus) that are life sustaining, while at the same time old ressources like crude oil may no longer be of value. Old forms to create electricity (Pluto – Atomic power – Uranus – Electricity) have to be overcome in order to make it through this necessary loss of value / loss of ressources. this re-evaluation also takes place in the individual, from the energy level an individual body is adapting to as well as the self-value and the expression of each of the inner flows of abilities. If the structure of the own life is not fitting this flow of inspiration, leading to the expression of the creativity, it will be crushed on the inner as well as on the outer. The shells will be cracked. For Europe, all planets are on the right side of the Horoscope, this indicates a harvesting time. What is emerging now is the outcome of various processes that took place in other times. This is to nation and individual a time, where the “flow of inspiration” may lead to rich fruits if placed well in alignment with the needs of Earth, and the needs of life itself. We reached again the middle column in the Dreamspell’s spin, 20 days in the middle of the tzolkin – the narrow path of truth that leads to the heart of the issue, the heart of the being, the heart of the galaxy. It is the narrow path of self reflection and understanding – whatever is cut off, denied, outsourced but belongs to the own true self and all of its incarnations is bouncing around in this narrow road. Whether it will be jumping around ahead, creating challenges to look at it again, or whether it will be jumping around in other direction, it is about the wholeness of „the true self“ . In the arrow path of truth, it doesn’t mattter where this may come from, may it be dimensions that are not well connected, may it be connections not aware of, or, as already mentioned, cut off parts too painful to look at, as they may have been cut off due to a shock… We face all of this in that narrow road until we alignn with our true sound, the whole being, communicating with the heart of the self and the heart of the galaxy. Therefore, on each of 9 months round of the Tzolkin’s spin, we have the chance to beome a person more whole, an Earth more whole. it is in this narrow road, that i like to ask you a favor. As you may have heard, deers, moose, elks in America, and also spreading now all over the world, caught a strange disease that similar to BSE in the 80’s in England. There is a sound healing session from Tom Kenyon, that was given to the world after Fukuhsima, to heal on three levels this dramatic issue. 3)inspiring people to develop the right medicine and techniques to solve an issue. I ask you to do this meditation as often as you can, not only focussing on Fukushima, but expanding it to all areas where animals are ill, may it be whales, doplhins, sea life, but especially now the deers, moose and elks. It is my understanding, that we face the sixth mass extinction, and that we have to deal with this issue, help the devic, but also develop technical devices, media, engineering and buildings in general, that are more life sustaining, life friendly. I therefore put the link to the listening section of Tom Kenyons website in here. He is very sensitive to copyright matters and that one deals in the right way with the sound meditations, therefore i ask you to read his listening agreement, agree with it , and then you find yourself in the section of the free downloads. There is the „Fukushima healing“ – please read his instruction, then you can download or listen to this sound bit with the intended meditation, expanded to the deers and other wildlife forms, the current climate challenges and technical blockages..
Below the link I copied and pasted the instructions, so you can tune in his description already. Whenever Fukushima is mentioned, expand it to the situation of the wildlife. It would seem that his words are turning out to be sadly prophetic. It is not in the scope, or the purpose of this message, to discuss the many ecological danger signals that point to Fukushima. Anyone interested in exploring the increasingly large pool of data, beyond the superficial treatment of the crisis by our mainstream media, can find a lot on the Internet by doing a search of the words “Fukushima radiation,” “Fukushima core meltdown,” and “Fukushima debris field.”I would just urge you to keep your “wits” about you as there is a lot of erroneous and hyperbolic information floating out there about the disaster. The facts are scary enough without having to go into unsubstantiated speculation. For the sake of clarity I would suggest reading reports from reputable scientists—especially those in the fields of nuclear energy, ecology and the marine sciences, as well as those who work in the fields of epidemiological research (meaning where cancer and radiation related illnesses are increasing in various populations including Japan and North America). I would also give more weight to respected alternative news sources. In my opinion these include, but are certainly not limited to, The Huffington Post (www.huffingtonpost.com), Energy News (www.enenews.com), Simply Info (www.fukuleaks.org), The Guardian (www.theguardian.com), and Greenpeace (www.greenpeace.org). 3) to inspire other humans in the sciences and technology sectors to create new technologies capable of dealing with the unprecedented challenges that Fukushima presents. Interestingly, the Hathors are of the opinion that in addition to new radiation management technologies, some of these new technologies will be “biologically based” and will be developed by cell biologists, as well as by researchers who work with mushrooms and fungi.The Hathors contend that when the Meditation itself is engaged properly, those working with it will, in effect, create a quantum field-effect that can affect future possible outcomes around Fukushima. In essence, those who work the meditation will be Jumping Timelines, as the Hathors call it.This is a very important piece of information, in my opinion, as it provides a theoretical understanding how such an ephemeral thing as this meditation could affect such a terrible situation in three-dimensional reality. I therefore suggest you read a previous Hathor message entitled Jumping Timelines, if you haven’t already read it. 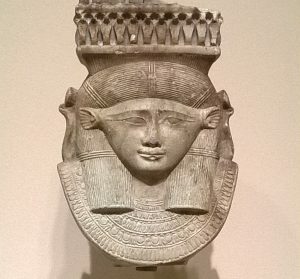 (Note: Click on the link above or go to www.tomkenyon.com and click on the Hathor tab. You will be taken to the Hathor Archives. Simply scroll down to the message titled Jumping Timelines). The sound meditation is 3:28 minutes long. 1) First, enter a coherent state of emotion such as appreciation, gratitude, impersonal love and/or ecstasy. Consciously enter a state of appreciation, gratitude, impersonal love and/or ecstasy according to your own capacity to enter coherent states of consciousness. The simplest coherent state for most people to enter at will, is simple appreciation. If you are more adept at these things, you can choose one of the more complex coherent emotional states as you wish. But to be clear, simple appreciation is enough of a coherent state to make the meditation effective. As the Hathors clearly state, you must be in a coherent state of mind and emotion that transcends fear in order to be effective at this. 2) Listen to the sound meditation while you remain in this coherent emotional state. 3) Imagine, in whatever ways seem natural to you, that the situation at Fukushima is being resolved in life benevolent ways.This type of knowingness is not just idle hope or mere fantasy on our part. It is the engineering of intention through the union of coherent emotion and mental clarity. This energized clarity is what creates the quantum field effect that the Hathors described to me when I asked them how such a meditation could contribute anything real to the situation.In other words, as those of us around the world engage the meditation, we will set into motion a movement of energies that can constellate into new and more positive outcomes. How this will show up will be anybody’s guess. But if the meditation is successful through all our joint efforts, I would expect to see an increase in both serendipity and new forms of creative problem solving in relationship to Fukushima. I suspect that within our world sangha there will be many variations of the meditation. The important thing is to work with it in ways that seem natural and plausible to you. Those of you who are experienced in engineering outcomes through meditative states of mind will undoubtedly know what to do. For those of you new to this type of meditation, my primary suggestion is to let yourself settle into and be enveloped by the coherent emotion that you have chosen. As you “let go” and really experience the coherency of your chosen emotion, you will eventually find a deep intuitive sense emerging. This type of intuition is from your own heart/mind, and it will reveal to you how to proceed via your creative imagination. In other words, once you have entered deeply enough into coherency and set into motion your intention of imagining a resolution, ideas will spontaneously arise within your mind.One of the many things I appreciate about this sound meditation is that it is short and effective. It shifts my brain state into a very receptive state quite quickly, and due to its length I find that I can easily fit the meditation into my daily schedule. This meditation is to be done on your own whenever you choose to engage it. ****************************************Passage Into the Devic and Angelic Realms©2013 Judi Sion All rights reserved.An extended play version of this sound meditation is now available as an mp3 download. After working with the Fukushima sound meditation multiple times, I realized that I wanted to listen to a longer version. This was because I found this particular sound meditation to be such a profound gateway into the Devic and Angelic realms of light. I therefore created a version of the sound track that is a little over an hour long, which I call Passage Into the Devic and Angelic Realms.I do want to be clear, here, that the 3:28 minute version is all that is needed for you to work the meditation effectively. You need nothing else sound wise.Passage Into the Devic and Angelic Realms is currently available only as an mp3 audio download.Click (link) to order Passage Into the Devic and Angelic Realms or go to The Store on the website (www.tomkenyon.com). On 19th February, 15.53 GMT, a full moon occurs. If you remember the energy of the new moon( two weeks ago (my article: ) , the Sabian Symbol was “a businessman at his desk”… referring to our culture and that whatever we are gaining should also contribute Earth. Since that, there were remarkable two weeks, starting from a a Starbucks CEO billionaire, saying he is rather a person of means, to an Amazon CEO blackmailed, to Amazon withdrawing – or forced to withdraw – from New York. From a tantrum(p)ing US President (businessman) declaring national emergency for not being able to organize money to build a wall around the country he lives in. If you remember the eclipse energies (http://blog.sternenfarben.de/2019/01/20/the-energies-of-the-total-lunar-eclipse-from-20-21st-january-2019/) , you may remember, that it was about ego-driven people, men which the blood rushes to their head. With this in mind, one may see that a lot of challenging aspects still active, in fact increasing in tension and expression. The last Sabian symbol spoke about the need to do something for Earth, not to just do business, while at the same time the spiritual world is not necessarily about the glamor it is spreading, but on a life lived by a greater purpose for the common, higher ood. So we saw also another rising of a climate change activity, this time from children – or newcomers, like the women freshly elected into the US Congress. This time the full moon’s Sabian Symbol is between 0-1 degree Virgo – and the Sabian Symbols (quoted at the end of the article) refers again to markets, merchandising, commerce, to social interaction – and spiritual awareness of our interconnectedness. The symbols speak of portraying one self in a current situation but also in the interaction with others, harvesting what one has sewn (or standing on an empty field of misharvest). With the energy of the eclipse still so present, I think it is quite obvious, that the challenging aspects, of what may happen to groups or markets, are at the focus therefore. It is a strange impulse that the energy of the moons are setting here. The eclipse in January setting an emphasis on the American presidency with a man having a blood-rush to this head, then the “business man”, now to another situation of “trade”. Whatever we started in this energy, it seems that the cosmos wants us to look deeply behind the scenes of what we call business. And to be prepared that interconnectedness may mean all situations of life on Earth. Therefore I would like to do again what I started in the last article, to look at three different charts in a matter of World-Trade and with an economic view. 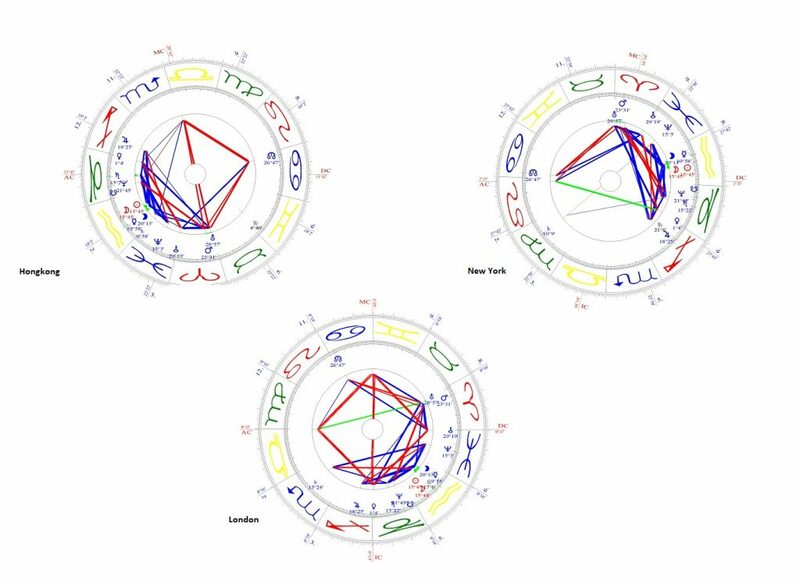 I calculated the horoscope of the full moon for New York, London and for Hongkong, in order to show three aspects in the financial and business world of today, and the differences visible. The full moon occurs around noon local time, with Sun and Lilith at the highest place in the sky. Saturn and Venus are located in the 8th house, which shows an emphasis on debt, on money from other sources than the own. Money (Venus) that has to do with hardship or walls (Saturn),with a structure (Saturn). But in the 8th house, the house of death, it is not the own resource. The second house of own ressoures shows Gemini as ruler, but an empty house The ruler of the 2nd house of the own talents and ressources is in the 10th/11th housecusp, with neptun. Oil and Gaz are the ressources that would be available, the ocean is a resource, the water in itself too. 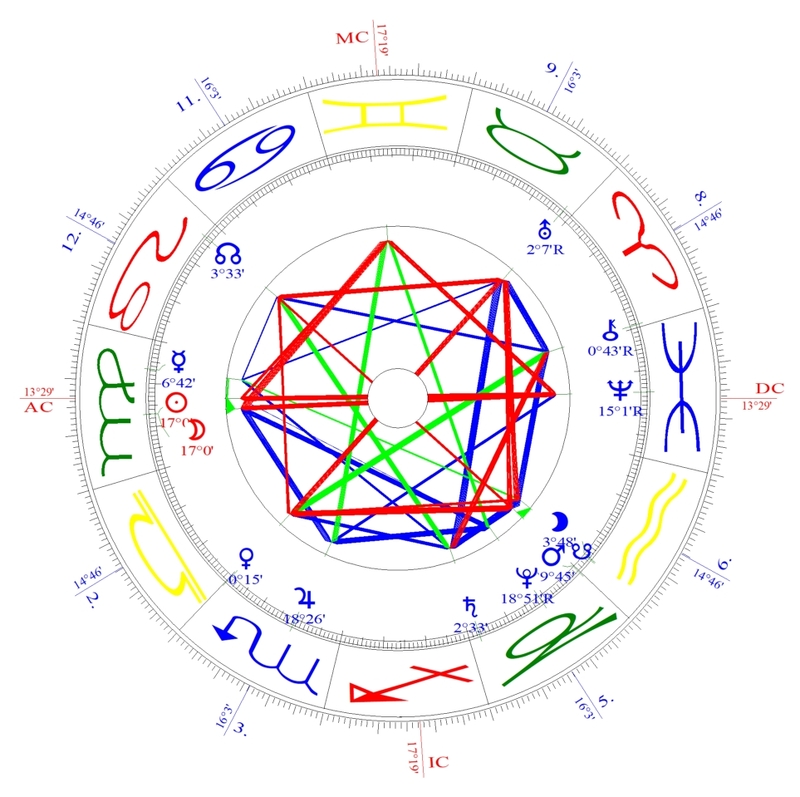 The ruler of the 8th house, Jupiter (for Sagittarious) is in the 7th – it has to do with loyalty, friendship, partnership – or –to be precise as it shows in the world, of the breaking of friendships, loyalties and partnerships due to it (Jupiter in a wide square to Mercury Neptun). The natural ruler of the second house, Taurus, is closed in the 12th. Uranus and Mars in it. They rather talk on war technology, media, wars than on the abundance of a green meadow. 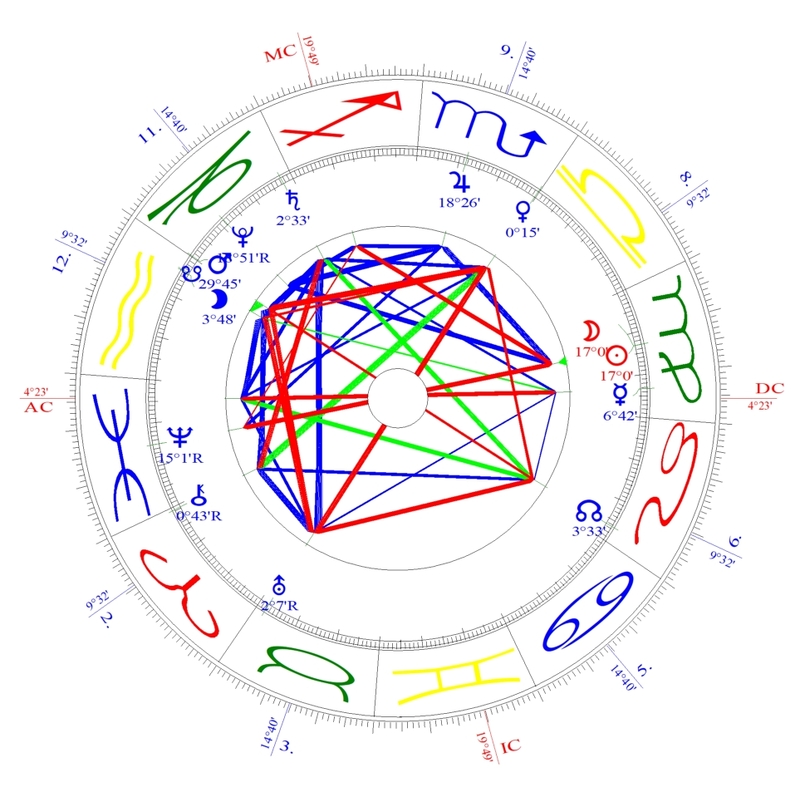 It is a deeply energized chart, that has a lot of “hidden” or veiled attributes. Mercury to Neptun is rather hidden communication, veiled words, Saturn and Venus in th e8th with a strong Saturn in the own sign of Capricorn, and a venus that shall follow that in manifesting money. Yet what my eyes are also fascinated by is Pluto southern node. Fate plays a part in here, Atomic power (Pluto) also. The past is present. What seems to be a power play of the current day is in fact an old game, coming from an other era. or refreshing the dangers of an other era (broken contracts – INF nuclear treaty). All planets are above the horizon, no matter how hidden or veiled, all is conscious and aware. 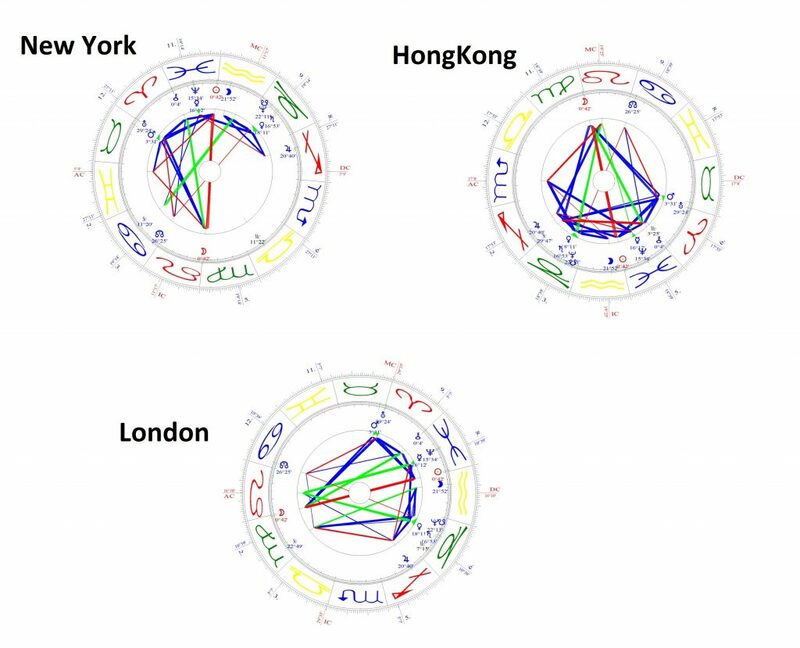 If you look at the chart calculated for Hongkong, you may notice, it is just the other way round as in New York. As above (new York) so below (China) Whatever New York and therefore the USA tries to accomplish, china has it. Saturn and Venus are in the 2nd house, also Jupiter. So the Planets that have to do with the urgency of the USA issues reside here more or less relaxed. With Scorpio rising, even the Pluto question is answered, as a power quest from ancient times. At the Munic Security Conference this weekend, Angela Merkel told the audience, that china was 1700 years the ruler of the world trade. it was only the past 300 years that this rulership was taken by Europe, America and then America and Europe. But they are rising just to their old place. Which can be seen here. There is no planet in the 8th house, no need for other currency. They have all the ressources for themselves (2nd house). If a partner or someone that tries to engage, approaches, they react with Taurus – Venus in the 2nd house in a strong connection to Saturn in its own sign. It seems, that whatever America is struggling, all is settled here. Whatever was above the horizon in New York, here it is below the horizon, it is an inner abundance, but also a kind of unconsciousness about it. An inner sleep of the themes so far. … has very different themes like New York and Hongong. Here we see a Leo Ascendent with the sun in the 7th house, joined by Lilith. The fight for independence visible as Lilith may represdeent the Brexit – no deal exit from EU. the 8th house is ful, it is also about the ressources of others, or a lot of hidden aspects tht are bringing debt (other peoples money). Veils, unclarity (neptun) in Contracts (mercury). Spoken word may not be trusted. Chiron joins, displaying that this theme may be a real wound emerging. 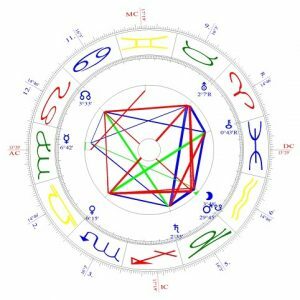 the 2nd house is as empty as it is in the US, the ruler Mercury is in the Neptun conjunction in the 8th house. At the MC one sees the maars/Uranus conjunction- the fight or independence, the firght in the media, the war for freedom, even maybe a lurking trade war visible. The focus the cosmos is setting, is only on the surface just regarding trade and economy. The symbols show rather that both sides of the story belong to spirituality, and at this time, there could be real spiritual life on Earth, with spiritual economy as well as a grounded spirituality in every day action. Thus both showing in coooperation and in a life-sustaining trade of pruducts harvested together. Yet with the eclipse energy showing so clearly in the past days, there is a deep concern for Earth, and the emphasis lies on cooperation, which humanity lacks at this point in time. The emphasis on the surface is on the portrait of a man, or on the business leader, on role or on image, while the symbols themselves urge for fulfilling the promise lying in these roles – a life lifed for the wellbeing of alland in coopertion. It will be an interesting time coming. PHASE 151 (VIRGO 1°): IN A PORTRAIT, THE SIGNIFICANT FEATURES OF A MAN’S HEAD ARE ARTISTICALLY EMPHASIZED. 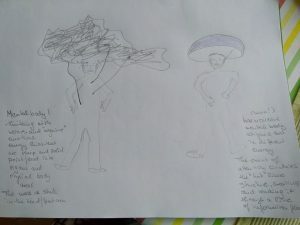 KEYNOTE: The capacity to picture to oneself clearly the salient features and the overall meaning of any life situation. During the two preceding Scenes the „feel“ of energy at work has been the dominant feature of a consciousness still strongly ego-centered yet at times eagerly and devotionally reaching up to a realization of divine or cosmic order. Now we have come in the seasonal cycle of the year to the sign Virgo. It is in a sense the symbol of harvesting, but it is also that of the Path of discipleship, and of all strongly determined processes of training, or retraining. Flooded with and having enjoyed and released energy, the personalized consciousness now has to learn the lesson of significant form. It must be able to see life situations as wholes of experience, and to discover their meaning by distinguishing their most characteristic features. 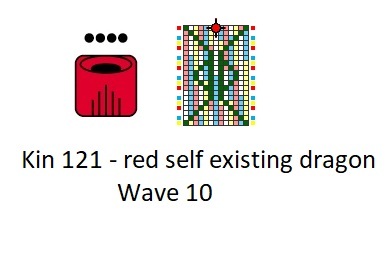 This is the first stage of the thirty-first five-fold sequence of symbols and its Keyword is DISCRIMINATION. Implied in discrimination is both analysis and intuition. The mind separates and identifies — and unfortunately often exaggerates — what makes a person or a situation different from another; but the intuitive responses of the whole person to what confronts him or her is also essential, for what matters is not only my or your „difference,“ but the place and function this difference occupies in the organic pattern of the evolution of „humanity as a whole,“ i.e. of Man. PHASE 331 (PISCES 0-1°): IN A CROWDED MARKETPLACE FARMERS AND MIDDLEMEN DISPLAY A GREAT VARIETY OF PRODUCTS. KEYNOTE: The process of commingling and interchange which at all levels demonstrates the health of a community. 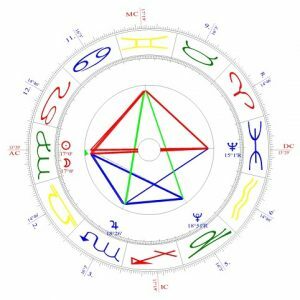 In any twelve-fold division of a complete cycle (for instance the 12 zodiacal signs and the 12 Houses of a birth chart) the twelfth section often has been given a negative significance. It can refer to oppressive conditions as it represents a „closing of accounts,“ a final evaluation of the harvest of the cycle. A very bad harvest may lead to bankruptcy; a premature revolt may bring the rebel to jail; the dissolute may end in a hospital. In this section of the cycle a man reaps what he has sown. But it may also be honors, social prestige, the interests of well-managed wealth. In this twenty-fourth scene what is stressed is the coming together, in a final experience of community, of all factors previously experienced; this means constructive interaction and an interchange of the products of social activity. In a practical sense, the symbol, whenever it is found, emphasizes that the time has come to take full advantage of the social opportunities to bargain and to trade. This is the first stage of the process related to the sixty-seventh five-fold sequence of symbols. It refers to all that can be gained from social interplay and especially, in the broadest sense of the word, from COMMERCE. This new moon is the start of the New Year in Chinese Tradition. The new moon takes place on the 5th of February (time zone of China). To the Chinese and their astronomical calendar referring to a 12 year cycle, it is the year of the Earth Pig, which is said to be a very material, financially successful period, which gives me reason to calculate the horoscope for Hong Kong – and for 3 other major financial spots on earth. KEYNOTE:The ability to organize the many aspects of an enterprise involving a large group of human beings. If you are aware of the current political debate in America, you may have noticed, that with Donald Trump a “business leader” is at the desk of the White House. You may also have noticed, that in the past days the founder and CEO of “Starbucks” the company paying no taxes almost anywhere on earth, but successfully selling coffee all over the world, is considering a run on the American Presidency. Partly the media is in a hype for him, partly media and political people are against him with a: “oh no, not another business man with no political experience but a lot of money to buy a campaign”. With this in mind, I was almost shocked to see the Sabian Symbol for the new moon. It IS about a business man. it IS about financial success…. and more. „A great deal of what is glowingly written about the Aquarian Age is probably sheer glamour. The New Age should be one in which man learns to use the power generated by human togetherness and group interplay — that is,to use it harmoniously for the welfare of the whole of which all individuals are parts, humanity and the planet Earth. This has never been achieved and only very rarely attempted. Mankind today must make a thorough and irresistible attempt, or be nearly destroyed — except for a creative „remnant“ of seed-persons who would have to begin again from new foundations. In the field of big business, of huge war undertakings (like the Normandy landing in World War II) or of major national efforts (like the Moon landings) great results have been achieved, but the motive and the quality of the human interrelationships involved were neither of permanent significance nor invested with a truly harmonic quality. The character of the techniques used were totally un-satisfactory from a „human“ point of view. Nevertheless there is much to learn from modern large-scale management and systems analysis, even in terms of personal endeavors of very limited scope. This is the first stage in the sixty-fourth five-fold subcycle. It introduces the concept of management which is basic at this period of the cyclic life process which the zodiac symbolizes, yet which needs to be totally reevaluated if mankind is to actualize the spiritual potentialities implied in the evolutionary transformation just ahead. If you take a closer look, you may see that the ascendant of the new Moon in Hongkong is Capricorn. 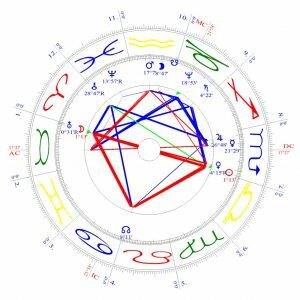 The Aquarian new moon falls into the second house. Saturn Pluto at the Ascendant in Capricorn may show some underlying questions: China a country coming out of a Saturn phase, where poverty was amongst their citizens, one child policy needed to stop an expansion of population beyond the structure they were able to feed themselves in autonomy. China is a large buyer of land and of resources on Earth, especially of rare earths, which are used in new technology like mobiles or computers. The new Moon of this new year falls in to the second house, so the challenge and the task are the own resources, 2nd house. The resources of other countries are seen in the 8th house so the new moon emphasizes the business with the own resources, with the own soil, the own dragon power, the own structures, rather than with other countries and nations resources. Saturn in Capricorn refers to the own structure. It is materializing matter. But in esoteric terms, Saturn itself in Capricorn asks whether the structures for a spiritual life are build. With Pluto on the Ascendant in Capricorn, the dealing and marketing of resources of earth will not be that successful on the long run, if too much emphasis is put upon. Even therefore the earth pig is a very material sign, with plot on the ASC the task is rather how to adapt to a changing surrounding and rare resources – resources that may show a lack very soon. with Pluto at the ASC China also may face a nuclear arms race as a striving world power to be. With Mars and Uranus at the IC though, Chinas power in arms may not necessarily in the traditional weaponry, but in a new form of warfare. Now let’s take a look to London. With a Brexit looming, the new moon takes place in the 5th house of self expression. Venus is at the IC, so the inner values may be of the utmost importance, expressing in a new form of self-expression. The whole economy of Great Britain may be in an adaption to a new quality of expression, yet only successful if adapted to the needs of earth and community. the nodes in the 10th house tell a tale on a new placement in purpose, while the southern node in the 4th house may show an alteration on each “home”. Referring to New York, we see an other emphasis of that theme. The new moon is placed in the 7th house, the house of partners and marriages. One sing of this may be then seen in contracts kept, forming partnerships. Pluto and Saturn in the 6th house together with the nodes may show, that this may have a great impact on the economy referring to the every day work workers do. America has all planets in the right hemisphere of the horoscope. This shows a time of harvest, where one needs to rely on the seeds already planted and blooming. the „others“ are coming to bring the harvest, the fruits of the efforts of the past. It may be an odd time for this harvest, as the crops they try to reap may be rich in fruit, or low growing due to disasters that took place, shattering the seeds. Mars is at the highest place in the chart, at the MC, so it may also be a harvest of all the wars fought.,or yet to come. It is likely that this may lead to a kind of war, at least to an incredible amount of energy and effort of each individual in order to fulfill something. No matter whether Hong Kong, London, New York, Rio or Tokyo, the challenge of today is not only the Business Man, but to understand Earth as an organism. it is not about seeing economics as a market, woven by calculable arithmetic. It is about the awareness, that success involves her whole entity. The success may not be measured in $, Yen, Yuan or British Pound under the Bottom line. Her measurement is the success of humanity and all life upon her. (..) the concept of management which is basic at this period of the cyclic life process which the zodiac symbolizes, yet which needs to be totally reevaluated if mankind is to actualize the spiritual potentialities implied in the evolutionary transformation just ahead. 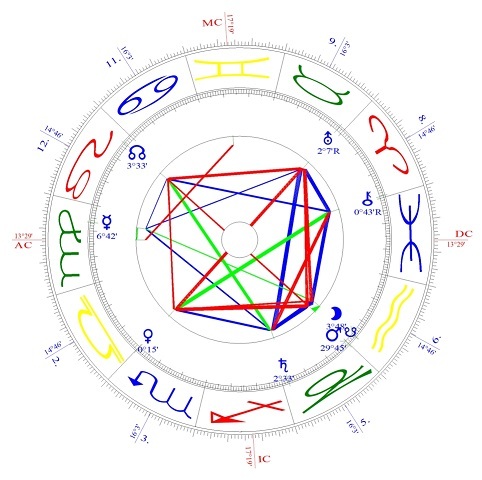 Source: Dane Rhudyar, An astrological mandala. The new year 2019 started with a solar eclipse on 06.01. It belonged to a series of Saros Cycle active throughout 2000. This is followed by the total lunar eclipse from 20/21st January, visible from Europe. This eclipse belongs to Saroscycle Lunar 134 and is part of multiple series of Eclipses that led through the year 2001, the year that represented a turning point in the lifestyle of the world in the aftermath of 9/11, and led to several wars. The consequences of this event and the wars that followed still have a negative impact and grip on humanity as a whole, the way we deal politically internationally with each other, how we see religions and certain religious practices, and impacted the quality of life on Earth. The eclipse series Saros Lunar 134 started in 1550. All eclipses of this series happen with the moon on the ascending node, the sun on the descending node. In general, the moon is usually referred to as mind and emotions while the sun is a symbol for one’ own life force and consciousness. On the global level, the moon is said to be a symbol for the people of a nation, so the population or citizens, while the sun symbolizes the ruler, the king of a country. In medieval times, a solar eclipse was a symbol for the death of a king, a change in reign and ruler in the country where it was visible. Eclipses in their visibility changed events and outcomes e.g. on the battlefields. Solar eclipses have a stronger effect on governments, lunar eclipses more on the area, how the population perceives and how they are doing. On a broader concept therefore one may say, Solar Eclipses are attributed to the king, lunar eclipses to the people, the wellbeing of a nation. The release and glorification of social aggressiveness. On the side of the moon, we see the image of a boxer. symbolization of the glorification of aggressiveness. The boxer enters the sparring is gloriously and socially recognized, even admired for releasing aggression in a certain way. Usually the sparring is in the light, the boxer known by name, while the people watching it are namelessly gathering around the area of the sparring. The symbol of the sun shows a crowd of people enjoying the beach. The experience the powerful elements of nature in a social environment, a dive into oceanic feelings of togetherness together with people partly known, mostly unknown to onself. The one on the “stage” though is nature in its force. The ocean as place of birth of all life on Earth. It is the contrast between artificially created display, controlled release of human aggressivity and the collective emotion and recharging of life force through the power and force of the elements of Earth. In both cases, the single participant of the crowd is almost nameless and unimportant as individual. In both cases there is participation in an event. But in one case it’s about an ego-force, trained, channeled and then showcased in a social accepted way, in the other cosmic and planetary forces are always at work in their own rhythm and cycle, and are just consciously experienced together. The fulfillment of the individual’s creative function through his participation in a group performance consecrated in a transcendent realization of unity. The participants in the boxing match, not visible in the limelight, are now giving way to a hidden choir singing for a religious ceremony. The ocean and the oceanic experience of the force of nature gives way to the evening scene in Venice, songs are also sung, but in the second symbol but not in the background of a ritual religious ceremony but a more cultural hymn, a song sung for the inhabitants or the passengers in the boat and the citizens and tourists of a town. Both scenes are human-made moments, they include sound. And a celebration of something in a larger context and crowd. Looking at this energy and to how 2001 was experienced one may see the rift in the energy possible and the one that was actually lived. The hidden choir may be a symbol for plans in the background, the religious ceremony though showed as a war against Islamic nations. The cultural values of the West was targeted and challenged from the East, seemingly attacked by motives of religion and lifestyle. The gondoliers were chanting songs of war, NATO countries working together under Article V as USA called the allies to help. As a result, there were declarations of war on terror that were in fact wars on nations populations mainly belonging to the religious and cultural majority of the aggressors. The symbols speak of festivities and celebrations, of planned and trained songs performed as a group in the background, fellowship in small and large ceremonial, religious and cultural actions, it showed festivities, livelihood, celebrations of joy and plenitude. But the year 2001 brought the opposite – the international community was culturally and religiously divided into axes of evil on one side, and the good allies on the other. The overtones of songs, the sounds of joy, were silenced in collectively displayed aggressiveness, individual acts against cities and states – retaliation war against „marked“ opponents and countries that were not involved at all or not that deep as blamed. Blood rushes to a man’s head as his vital energies are mobilized under the spur of ambition. An Eruption of bio-psychic energies into the ego-controlled field of consciousness. An old adobe mission in California. The power inherent in all great human works to endure far beyond the workers’ life span. Keyword: The concretization of an ideal. The symbolism now shows the energy of a man whose blood is rushing in the head, because ambitions and ego energies take possession of him. His energies erupt uncontrollably into the collective, setting things on fire in a blaze. The Sun’s symbol displays an old adobe building, an old mission in California, and the power that lies in all the work and cooperation of people who want to build something of value that lasts beyond their own lives. Ideals that want to be realized. What is really interesting in this symbolism is to compare them with everyday events. One can not help but to compare it to public events and speeches given by “Trump”. Mr. Trump, a man that usually looks is quite red-faced in public, as if the blood has rushed to his head. But quite often also tempered, and therefore setting things on fire in erupting ambition, mostly ego-driven. I therefore like to point out, that it is also important to see, on what date during the year the Lunareclipse is occurring. 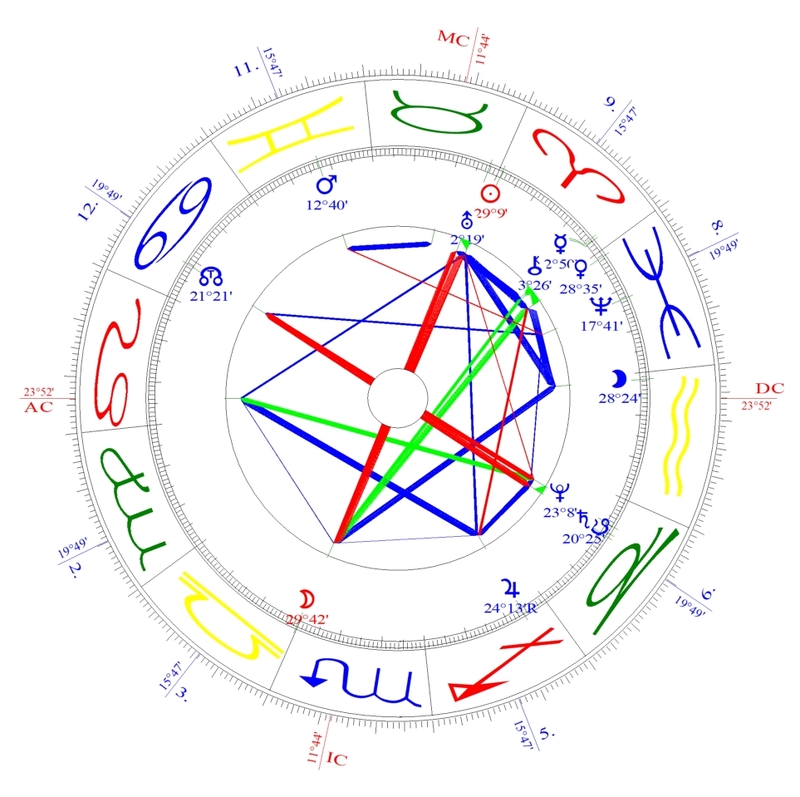 American Presidents are inaugurated (since the 1930’s) on January 20, when the sun reaches 1 Aquarius. The power inherent in all great human works to endure for beyond the workers’ life span. The American presidency since the 20th century is therefore rooted in the energy , which the eclipse is activating or overshadowing. The American Dream, democracy and republic, is the dream of more than one life span. The nation as a whole is the concretization of an ideal. And now it is faced by a man whose blood rushes into his head due to ambition. Just as in 2001 where the symbol of the religious choir distorted into wars between religions and worldviews, so may the image of a over-energized ambitious man on one hand be a threat for the building of ideas. The world faces on the political arena a person like Trump, currently shutting the democratic processes down to fund a wall, a building that may endure its own lifetime while violate the ideals that are vested in the presidency itself. Trump may be eclipsing the values of America, so to speak. The image emphasizes a rush of energy not well handled, uncontrolled and therefore harming, setting ablaze while bursting into the outer, while on the other hand an image of old ideals exist, in a quite, almost resting mode. Almost as a tradition remembered, not necessarily a building inhabited. The old, clay-built mission indicates an enduring act, a house of collective significance, in time and space. It’s not about only a house, but a mission. A mission served as a building to spread a religion in an area unknown of it, whether this spreading was peaceful or violent, welcome or rejected. Yet as the mission building survived the times, it was successful. In a strange way therefore the symbol of the adobe mission in California shows also the energy of the nearby Mexican boarder and lifestyle, the connection to South America, and how the American way of life and the South Americas intermixed and blended their ways of living. The images of the previous lunar eclipses were European as well as global in nature. Churches, choirs can exist almost everywhere in the Northern Hemisphere. Oceans and beaches exist all over the planet. Gondoliers exists only in Venice, i.e. in a spatially and culturally limited area, where people have reconciled with the forces of the nearby ocean flooding their city. The forces of nature are taking back their ground, while gondoliers sing their songs in the life that slowly adapts to it. The sounds of a choir takes place in a ceremony, the flooding of the city by the ocean takes place slowly over centuries, adaptable for the inhabitants so far. In the Arc and overview to the point of origin – we see a symbol that captures the display of aggressiveness – the sparring boxer, who trains to show off in an artificial fight that serves to discharge mass emotion. It is replaced by a single human being where the energy is rushing to the head through ambition and situations not well handled. There is no release of energy in a formalized way, but the explosion of energy in an uncontrolled manner. The images of togetherness, of oceanic feelings by experiencing the elements and the forces of nature disappeared. It is a building. Quiet. Still. Contrasting the constant movements of nature, waves on a shore. This solar eclipse therefore may show the danger of forces not handled well, of lost contacts to nature and society, and overflowing ambitions, egos crying for power, not able to handle them. Old venerable traditions and buildings are a target of this energy outburst, quiet energies that existed reliably as an offer may now be endangered by energy outbreaks. As mentioned before, eclipses always are a time of changing, and in the traditional way to see them, a solar eclipse was seen as death(replacement) of the king/ruler of a country. As his eclipse series is incredible deeply woven in events with 2001 and therefore with America, and as the eclipse from January 20/21 is the inauguration date of all presidents (since 1930’s) I predict that Trump will be overthrown or needs to resign during this year, not necessarily in January, but most likely during the solar eclipses in the summer (July 2019). If Trump is not leaving the presidency, the energy of this eclipse and the eclipse series indicate that the presidency itself, and the way the energies are handled, twill undermine the ideals of the founding fathers, of democracy and republic, and therefore the Presidency itself will undergo vast changes. Either Trump is replaced, or the presidency and democracy of America is altered beyond recognition. But more on that in the article to come…..
My individual advice for the current eclipse indicates to be self-confident, self-critical, aware and mindful of both your own energies and the collective issues. Balancing the forces that want to rush in the head with ambition. It is of similar importance to be aware of the rifts in society that emerged after 9/11 through naming and blaming of opponents instead of a togetherness as a human family, impressed by nature in an oceanic feeling of its forces. May the stars shine upon you, and may your own inner star show you the way. Das neue Jahr 2019 begann mit einer Sonnenfinsternis am 06.01. Sie gehörte zu einer Sarosserie, die 2000 aktiv war. Nun folgt am 21.01. die totale Mondfinsternis, die von Europa aus sichtbar ist, und diese gehört einem der Saroszyklusse an, die durch das Jahr 2001 führten, das Jahr, das mit 9/11 eine Zäsur im Lebensstil der Welt darstellte, und zu mehreren Kriegen führte, deren Folgen bis heute die internationale Gemeinschaft negativ hineinwirken und die Lebensqualität auf der Erde beeinträchtigte. Mein Anliegen mit diesem Artikel ist daher einen Überblick über die Energien zu geben, die sich zyklisch wiederholen und damit 2019 kollektiv mit bestimmen, und aufzuzeigen, was die Energie der Finsternisse als Entfaltungsmöglichkeit und Arbeitspotenzial in sich tragen. Die Finsternisserie Saros Lunar 134, der die Mondfinsternis vom 21.01. angehört, startete 1550. Sie ist eine Mondfinsternisserie, die am aufsteigenden Mondknoten stattfindet. Der Mond, die Gefühle im Kollektiv, stehen am aufsteigenden MK, die Sonne steht jeweils am absteigenden Mondknoten. Neben der allgemeinen Deutung von Mond = Gefühle, Sonne = Lebenskraft und bewusstsein kann man kollektiv auch die Entsprechung Mond = Bevölkerung, Sonne = Herrscher / Regierende eines Landes ansehen. Sonnenfinsternisse wirken hierbei stärker auf Regierungen, Mondfinsternisse eher auf den Bereich, wie sich die Bevölkerung wahrnimmt und wie es ihnen geht. Auf der Seite des Mondes ist also das Bild eines Boxers, der den Sparring betritt, um auf glorreiche Art und sozial anerkannt. oder sogar bewundert, Aggression freizusetzen. Die Seite der Sonne zeigt eine Menschenmenge, die den Strand genießen. Sie erleben die kraftvollen Elemente der Natur in einem sozialen Umfeld, tauchen in ozeanische Gefühle der Gemeinsamkeit ein. Es ist der Kontrast zwischen künstlich hergestellter Zurschaustellung, und der kollektiven Ergriffenheit und dem Auftanken von Lebenskräften durch die Kraft der Erde. In beiden Fällen verschwimmt der einzelne Teilnehmer der Menge. In beiden Fällen gibt es die Teilnahme an einem Event. Doch in einem Falle geht es um eine Ego-kraft, trainiert, kanalisiert und dann sozial akzeptiert zur Schau gestellt, in dem anderen um kosmische und planetarische Kräfte, die immer wirken, und bewusst miteinander erlebt werden. Die Sonnenfinsternis dieser Serie in 2001 hatte folgende Energie. Die im Rampenlicht nicht sichtbaren Teilnehmer an dem Boxkampf weichen nun einem verborgenen Chor, der für eine religiöse Zeremonie singt. Der Ozean und das ozeanische Mit-erleben der Naturgewalt weicht der Abendszene in Venedig, es werden ebenfalls Lieder gesungen, doch hier ist es vor dem Hintergrund der kollektiven Zeremonie, einem Lied das für die Bewohner oder die Mitfahrer in dem Boot gesungen werden. Festlichkeit liegt in der Luft. Beide Szenen sind von Menschen gemachte Momente, sie beinhalten Klang, in dem einen Falle einen Chor und eine kirchliche, religiöse Vorführung, in dem anderen Einzelne Sänger, im Gleichklang oder als Einzelserenaden eine kulturelle Darbietung gebend. Es wird gefeiert, gemeinsam. Wenn man sich diese Energie ansieht, zeigt sich in 2001 die Kluft dessen, was sich auftat. Ein Attentat aus den Reihen eines Angehörigen des Islam wurde in der Weltöffentlichkeit als Angriff einer Religionsgemeinschaft auf eine andere wahrgenommen. Nicht nur kulturelle Werte, wie der Lebensstil im Westen, schienen aus islamischen Bereichen angegriffen zu werden, es schien auch wie der Beginn eines Religionskrieges. Infolgedessen gab es Kriegserklärungen an Nationen, deren Bevölkerung hauptsächlich aus der religiösen und kulturellen Mehrheit der Angreifer bestand. Die Symbole sprechen von Festlichkeiten und Feierlichkeiten, vom Miterleben der Gemeinschaft in kleinen und großen zeremoniellen, religiösen und kulturellen Handlungen – doch das Jahr 2001 zeigte das Gegenteil davon – die internationale Gemeinschaft wurde kulturell und religiös gespalten in Achsen des Bösen. Die Obertöne der Lieder, die Klänge von Freude, verstummten in kollektiv gezeigter Aggressivität, Einzelakte gegen Städte und Staaten – Vergeltungskriege gegen „markierte“ Gegner und Länder, die nicht beteiligt waren. Der Mond steht nun also in der Energie eines Mannes, dessen Blut in den Kopf schießt, weil Ambitionen und Ego-Energien von ihm Besitz ergreifen, und seine Energien unkontrolliert in das Kollektiv eruptieren, während die Sonne auf dem Bild einer Szenerie liegt: Eine alte in Lehmbauweise errichtete Mission in Californien, und die Kraft, die in allen Arbeiten und Verrichtungen von Menschen liegt, die etwas errichten wollen, was über ihre eigene Lebensdauern hinausragt. Die Ideale wollen verwirklicht werden. Nun muss man jedoch wissen, dass seit den 1930’er Jahren in Amerika sämtliche Präsidenten am 20. Januar in das Amt eingeschworen werden. Astrologisch ist dies, wenn die Sonne 1 Grad Wassermann erreicht hat. Das Symbol, die Energie dieses 1. Grad Wassermann ist: An old adobe mission. die Konkretisierung eines Ideales, das Werk, dass größer ist, als ein einziges Menschenleben, ist die Amerikanische Präsidentschaft und damit die Demokratie. Wird ein Präsident eingeschworen, wird er in dieser Energie eingeschworen. Das Bild eines Mannes, dessen Energie ihm zu Kopf steigt, passt nun jedoch nur zu gut auf Trump, der bei öffentlichen Auftritten zu rotköpfigem Aussehen neigt. Die Beschreibung, ihm seien Ambitionen in den Kopf gestiegen, passt als bild nur zu gut. Und damit sind wir inmitten den eigenartigen Energien, die seit 2001 die amerikanische Energie einscheidend prägen, und deren Auswüchse durch Barack Obama so gemildert wurden. So wie 2001 aus dem religiösen Chor ein Zerrbild im Krieg zwischen Religionen und Weltanschauungen wurde, so drängt sich mir mit dem Bild eines Mannes, dem das Blut in den Kopf schießt, weil er Ambitionen bekommt, Trump auf, der nach einer Mauer, einem Bau, das seine eigene Lebenszeit überdauern möge, schreit. Doch das, worum es geht, ist nicht das lehmgebaute Gebäude, sondern die Konkretisierung des Ideals einer Demokratie, einer Republik. Eines Zusammenlebens von Nationen und Menschen. Das energetische Bild der Finsternis betont die überschießende Energie, die nicht beherrscht oder kontrolliert wird, während auf der anderen Seite alte Ideale existieren, fast ruhend zur Verfügung stehen. Die alte, in Lehmbauweise errichtete Mission, zeigt ein Überdauern einer Tat, eines Hauses mit kollektiver Bedeutung, in der Zeit an. Es geht nicht um ein Wohnhaus, das die Zeit überdauerte, sondern eine Mission. Eine Mission diente einer Religion bei ihrer Verbreitung, mag diese Verbreitung nun friedlich oder gewalttätig gewesen sein. Wenn das Missionsgebäude überdauert, war sie erfolgreich. Es treffen sich also Bilder von auswuchernder, unverantwortlich oder überschießend gebrauchender Energie in einem Kontext, mit Bildern von ruhender Kraft mexikanisch – südamerikanischer – amerikanischer Lebensweise, die sich gemischt, durchdrungen und überdauert hat. Die Bilder der vorherigen Mondfinsternisse waren teils europäischer oder globaler Natur, Kirchen, Chöre können fast überall auf der Nordhalbkugel existieren, Ozeane und Strände gibt es überall, Gondoliere gibt es nur in Venedig, also in einem räumlich und kulturell abgegrenzte Bereich von Menschen, die sich mit dem nahen Ozean und einer überflutenden Stadt in Einklang gebracht haben. Die Überflutung mit Klängen durch den Chor erfolgt in einer Zeremonie, die Überflutung der Stadt durch den Ozean erfolgt langsam in Jahrhunderten, für die Bewohner adaptierbar. Doch nun gibt es ein Symbol, das die Zurschaustellung von Aggressivität aufnimmt – der Boxer im Sparring, der trainiert, um in einem künstlichen Kampf sich zur Schau zu stellen, und zur Entladung der Massenemotion zu dienen, wird durch einen einzelnen Menschen ersetzt, dem die ganze Situation und Energie zu Kopf steigt. Die Bilder von Gemeinsamkeit, die kollektiven Energien des gemeinsamen Erlebens oder Feierns, dem Genießen der Natur, dem Einklang mit etwas größeren, sind in dieser Energie verschwunden. Diese Sonnenfinsternis zeigt daher aus meiner Sicht ein ausuferndes Ego, das mit den hereinströmenden Energien nicht umgehen kann, jedoch nach ihnen schreit. oder welche Energien sozial und gesellschaftlich zur Schau gestellt werden. Alte ehrwürdige Traditionen und Gebäude sind ein Teil, oder das Ziel, dieses Energieausbruches, ruhige Energien die verlässlich als Angebot existierten, mögen nun durch Energieausbrüche ersetzt werden. Ich möchte ausdrücklich hervorherben, dass amerikanische Präsidenten prinzipiell seit den 1930’er Jahren am 20 Januar eingeschworen werden, wenn die Sonne auf 1 Grad Wassermann steht. D.h. das Bild der in Lehmbauweise erbauten Mission ist das Bild der amerikanischen Präsidentschaft. Eclipsen haben immer eine Betonung auf Wechsel, und in der alten Deutungsweise sagte eine Sonnenfinsternis den Wechsel des Herrschers voraus. Da diese Finsternis so tief mit der amerikanischen Präsidentschaft verbunden ist, und die Finsternisserie mit 2001 eine starke Übertonung erfährt, wage ich die Vorhersage, dass Trump während den Sonnenfinsternissen im Sommer (Juli 2019) gestürzt / ausgewechselt wird, oder zurücktreten muss. Wenn dies nicht der Fall ist, wird Trump als Person, der die Ambitionen zu Kopf schießen, die Präsidentschaft selber, und damit die Demokratie, stark verändern. Dies wird dann ebenfalls im Juli 2019 den Höhepunkt oder die Sichtbarkeit erreichen. Doch mehr dazu in anderen, späteren Artikeln über die kommenden Finsternisse. Mein Rat ist, selbstbewusst, selbstkritisch und achtsam sowohl mit den eigenen Energien als auch mit den kollektiven Themen umzugehen. Es ist aus meiner Sicht wichtig, sich der Risse in der Gesellschaft, die nach 9/11 entstanden sind in der Erklärung von Gegnern, und wie das Böse sich in der Welt zeigt, bewusst zu werden. Die Saros-Serie hat als Ziel, die Gemeinsamkeit und das gemeinsame Erleben zu stärken. Damit wird alles sichtbar, was diesem im Weg steht. …mögen die Sterne Euch leuchten und euer eigener innerer Stern Euch den Weg weisen. ebenso verfügbar im Internet über das Dane Rudhyar Archive Project. Farbverbindung / color connection Foto credit: B116: copyright Aura-Soma Products Limited Alle anderen Flaschen mit schriftlicher Genehmigung von Aura-Soma Deutschland. Am 14. Januar um 14 Uhr Ortszeit wurde in England die Flasche B116 „geboren“ und Queen Mab genannt. Farbkombination: königsblau über magenta. Sie hat Referenzen zur Queen Mab / Maeve und deren Mythologie. Ich möchte sie daher dazu einladen, selbst die Mythologie zu erkunden. Chakrenmässige Zuordnung ist der Kopfbereich ähnlich den bereits vorhandenen Equilibriumölen B1 / B20 und B0 – mit Bezug zur B25. Sehr interessant geschriebenes Buch aus der Sicht eines Menschen, der nur langsam altert…. The full moon on 24th October takes place in an exact square to the nodes. All issues and themes of this year’s eclipses are again activated, karmic, and with effect. The pressure of the insights will mount up to the understanding, that some actions have dire consequences. Yet the good in all of this: if there is so much pressure mounting, then the time for change and correction is here! Why else would the cosmos give so much energy to one place or issue alone, if it was about to be able to change it, now? Adding to this mounting pressure of karmic insight is Uranus in Taurus at the point of the moon, and Venus in konj. to the Sun in Scorpio. Uranus with moon allows very deep emotional layers to be open and penetrated, releasing the pressure hidden in an explosive momentum, allowing insights into the deepest layers of suppressed issues. This happens individually as well as collectively, yet it is also possible that Gaia, Earth herself, undergoes this pressure in sudden release of locations that are uncomfortable to her, may it be as sudden volcanic activity, may it be landslides and floods (scorpio) or moving soil / liquefied Earth (Uranus moving earth /Taurus very fast), or other forms of sudden releases solidified energies e.g. earthquakes (Uranus in Earth sign). On social or collective layers this energy could also contribute to sudden flash-mob outbreaks of suppressed or very dense / intense emotions, or it may spark very large public movements of revolutionary ideas, reforming stiffened structures in society. As the nodes are in an exact square on Leo/Aquarius, the mounted frustration may also be in regard to the ideals of the 68‘ movement and the flower power generation. How much do these ideals collide with the mounting of the tightening neo-conservatism or authoritarian energy? The ideals of the age of Aquarius are tested whether they are seen, whether they can still be lived? A lot of the former fighters of the 68’s “make love not war” may be challenged under the current circumstances and may be frustrated in regard to their fight – and love – that seem to disappear from the collective. Collectively, this is another cosmic alarm situation. It is about to penetrate and access the next layers of change, just the next layer of energy not addressed yet. the new layer shows mixed with a generation used to technology, networking, and so much in an every-day freedom energy that the ideal itself seems not accessible, and the ideal too normal. By the time of the 68’s mass happenings could take place in mostly unpolluted areas, no acid rain fell down from the sky. The real challenge was to crack the structures of war, imperialism and colonialism, dusting off the past, where ideals like some democracies have been installed, yet the way to think was not free, and international cooperation slowly started but also failed in the first attempt of the league of nations. The forests were healthy, the only issue was deforestation, therefore the protests started around the exploitation of natural resources, which lead to the green party movements all over the world. The Nazism energy needed to be cleansed out, that had rooted it poverty, devastation after war, and the imperialistic thoughts of superiority versus minority, which needed regular overturns in order to get the higher position. This stuff needed to be cleansed out, so fresh starts could be done. Yet now, Nazism is back, on new levels, with seemingly similar arguments and rhetoric, yet with a different ground to sew and root in. Even though some speeches may be – or sound – the same, the people are not. the situation is not. it is not the world after the great depression, it is not the dust bowl famine in America, the stock market crash and inflation time, where money wasn’t worth a thing and nothing to buy was there. It is not the time, where repression had its toll, and structural changes needed to be done in order to get democratic structures also in administration. the 68’s movement grounded ideals of freedom after colonialism and monarchical imperialism, followed by fascism. Together with workers fights of the 50’s 60’s era, they laid the foundation for the equality amongst people and nations, and they formed the communities where these ideals could be lived in society as a whole. Yet exactly these models are now in threat, therefore the questions of the times are: what ideas succeeded, what form of communities remain, where does society now show a lack of support, a lack of ideas, where did structure crumble, and where did ideals show erosion? It is a new kind of pressure on the “Aquarian age” vision, a pressure that comes from the need of adaption to an other form of life, estranged of nature and fed by technology. So for the Pluto in Leo generation it is not time to withdraw, as they are needed again – or – their time is now starting. Being the grandparents of the current generations it is their time to be the wise people of society, teaching the values of what was reached. it is also their time – again – to inspire and explain the values, yet in a different surrounding. Both Mars and Lilith are in Aquarius, so they also talk about the ideals of the new male within this movement and the emancipatory energy of the new female energies in this form of living. As they are on the southern node, they both remind people about the active fought changes men and women went through to form new communities, and they remind the fighters of that time, too. As for Europe, by the time of the full moon Pluto is at the MC. Together with Saturn in Capricorn the Lords of time, law, structure show their power. It is a time of “old men” law and order, of structural power, of power abuse visible now, of patriarchic structures where certain kind of order did not ease life but was a form of power. There is a deepening in understanding of time and power, of order and structural density up to immobility. It is about the question, what structure is serving society, earth, people and life? what structure is just deepening and tightening a grip on something or people. All of this Is now clearly to be seen. The hidden structures that held power in place will now be revealed to the public eye. Even though hidden by the light of the day (as the stars can not be seen during the daylight) daylight it is nevertheless the most visible place in the horoscope, and so the theme of visible-invisible – but now to be seen clearly, is playing around in hidden and in open. it will be about real depth, and to look deep into the shadow, the own one, and the ones of society and the collective. There is no way to look in an other direction, as all forces will mount energy and tension so that the real decision is done. The forces do no longer hide, and therefore there a no longer excuses for non-action. it will be a time of reflection, inner pressure, and outer outbursts during this full moon. Yet again – the energy and the pressure is there, as we need it in order to do the real changes. the universe only offers the vast amount of energy as it is necessary to really change. If you look at the Sabian Symbols , you will find all the energies mentions also addressed – it is a time of synchronicity, where no one is able to look away, the suppressed will come to the surface, and the time of transformation has arrived. May the stars shine brightly, and may your soul star guide your path! PHASE 32 (TAURUS 2°):AN ELECTRICAL STORM. KEYNOTE: The cosmic power able to transform all the implications of natural existence. At this second stage of the five-fold sequence we see a picture which contrasts with the one for the first stage: thus, a celestial display of powe versus a clear, lovely-sounding little stream. Back of every natural self-expression stands the tremendous power of the „Soul-field,“ itself but one of the myriad aspects of the Creative Word that is the origin of this universe. At certain times, this power compels the natural earth-conditioned personality to accept, perhaps in awe, the spiritual potentialities of its „higher“ celestial destiny. This experience of power can both illumine and shatter. The next symbol reveals its positive possibilities. This is a stage of existence in which „revelation“ is implied, at least as a potentiality. The consciousness may be deeply disturbed by THE VISITATION, but the substance of the individual being can be fecundated by the experience. PHASE 212 (SCORPIO 2°): A DELICATE BOTTLE OF PERFUME LIES BROKEN, RELEASING ITS FRAGRANCE. KEYNOTE: The accidental nature of opportunities that impel one to break away from a past, the remembrance of which is still poignant and cherished. A new and greater realization usually demands the sacrifice of something which has brought loveliness and fragrance to a lesser form of living and feeling. Old feelings are poignantly remembered, even as one moves into a new and wider sphere of experience. Old relationships may be left behind, but the memory of their essential moments lingers on, perhaps strong and nostalgic. This is the second stage of the forty-third sequence. It contrasts with the first in that it reveals the difficulty of dealing with the past as one enters into a new realm of feelings. To the excitement of novelty answers the memory of the graciousness of the past one has SURRENDERED. Der Vollmond vom 24.10. findet in einem exakten Quadrat zur Mondknotenachse statt. Die Themen der Sonnenfinsternisse dieses Jahres stehen im Raum, karmisch, und mit Folgen. Der Druck, den die Einsicht ausübt, wird sich in diesen Tagen aufstauen bis hin zu der Erkenntnis dass manche Aktionen Folgenschwer sind. Doch das Gute daran: wenn der Druck sich derart aufbaut, kann und soll auch eine Korrektur stattfinden, da der Kosmos ja genügend Energie für eben diese Korrektur bereitstellt. Zusätzliche Energie gibt Uranus in Stier am Vollmondpunkt, Venus in Konjunktion Sonnenpunkt im Skorpion. Uranus mit Mond gibt in dieser Konstellation sehr tiefe Gefühlsschichten, die explosionsartig nach oben kommen, Einsichten in die tiefsten und teilweise verdrängten Gefühlsebenen. Dies betrifft individuell also die psychische Ebene, doch kann sie auch Gaia betreffen, wenn sie sich an unangenehmen Plätzen heftig bewegt, sei es, dass sie – mit Mond in Skorpion – Erde verflüssigt, Vulkanausbrüche forciert, oder für andere Formen der Freisetzung aufgestauter Energien sorgt (Erdbeben). Auf kollektiver, sozialer Ebene kann es zu explosionsartigen Ausbrüchen unterdrückter Gefühle in Gesellschaftsschichten oder kultureller Unterschiede geben, ich würde hier das gesamte Spektrum in Bezug auf die Energie, die sich bildet, erwarten. Dies kann von tiefenpsychologisch verdrängten unverarbeiteten oder geschürten tiefen Emotionen, die man z.B. in Mob-Energien mit plötzlich stattfindenden Hetzjagden bis hin zu Freisetzung von revolutionären Ideen durch Gesellschaftliche Bewegungen reichen. Da die Mondknoten in exaktem Quadrat sich auf der Löwe/Wassermannachse befinden, ist der angestaute Frust unter anderem auch die Diskrepanz zu den Idealen der 68-er Revolution und Flower Power Generation zum jetzigen Muff mit verhärteten neokonservativen Ideen zu sehen. Die Ideale des Wassermannzeitalters stehen im Raum, doch werden sie gesehen? Viele der Kämpfer der 68’er könnten bei diesem Vollmond in Krisensituationen geraten, in dem sie an sich und der Welt gerade jetzt zweifeln. Die Frage steht im Raum, ob alles umsonst gewesen war. Auf kollektiver Ebene ist dies jedoch ein erneuter Weckruf, die nächsten Schichten anzugehen, um die notwendigen Veränderungen – jetzt – auf die jetzt notwendige Art, angepasst an Technik und Gesellschaft, in die Wege zu leiten. Zur Zeit der 68’er Revolution waren die Flüsse noch sauberer, die Natur unberührter, viele Happenings fanden auf offener Wiese unter freiem Himmel ohne sauren Regen statt. Waldsterben gab es in der Zeit nicht, sondern Protestbewegungen gegen Abholzung z.B. bei Startbahn West Bau in Frankfurt. Der Muff von 1000 Jahren wollte noch beseitigt werden, die Überreste, die sich gesellschaftlich noch gehalten hatten. nun sitzt ein neuer Muff da, bzw. ist dabei, in die Parlamente einzuziehen. Es ist also nicht mehr der Alte Dreck, der ausgekehrt wird, sondern es hat sich eine neue Schicht gebildet, die auf anderen Gründen, oder einer anderen Form des Denkens gründet, sich dort aber festsetzen konnte. Es ist der gleiche Kampf zu kämpfen, doch mit anderen Begründungen, denn es ist ein Unterschied, ob man endlich die Vergangenheit hinter sich lassen möchte, und damit all jene, die an etwas mitwirkten, ersetzt, oder ob nach einer Zeit des freien Atmens und der Bewegungen in eine andere , freie, demokratische Gesellschaft nun diese Energie auf einer anderen Ebene in dieser Schicht erneut wurzeln möchte. Die 68-er setzten freiheitliche Ideale durch, nachdem weltweit sich die meisten Staaten aus dem Kolonialismus und Imperialismus der Monarchien und Kaiserreiche, und gescheiterter Demokratischen Versuche und internationalen Erst-beziehungen wie den Völkerbund herausgearbeitet hatten. Die 68-er brachten endlich die ersten wirklichen Lebensmodelle. Doch nun stehen genau diese Ideale erneut auf dem Prüfstand – welche Modelle haben gehalten, wo gilt es, neues zu erobern. Wo jedoch ist das, was man aufbaute, so wacklig, dass andere in alten diktatorischen Energien sich dort neu ansiedeln, neu säen und verwurzeln wollen. Die 68-er sind also mit gefragt, die eigenen Ideale abzustauben, und die Gesellschaft in dieser Spiralbewegung nach oben erneut anzusehen, in vollem Bewußtsein der jetzigen kollektiven Lage eine andere Bewegung in Gang zu setzen. Gerade sie, die die Ideale mit säten, sind auch die, die das Unkraut sehen können. Sie sind gefragt, der neuen Generation die Hilfestellung zu geben, was sie damals begeisterte, denn die Begeisterung von damals ist das „normalo“ von heute. Mars und Lilith sind beide in Wassermann, in dem sich auch der absteigende Mondknoten befindet. Die alten Kämpfe von damals stehen also im Raum, die Kämpfe um Unabhängigkeit, sei es gesamtgesellschaftlich (Mars), oder auch Emanzipatorisch (Lilith). Für Europa steht zur Zeit des Vollmondes Pluto direkt am MC, die Themen von Macht und Struktur, struktureller Macht und Ordnung stehen im Raum. Da auch Saturn in Steinbock ist, gibt es eine Vertiefung des Themas der Macht der Herren der Zeit. Welche Struktur soll gehen, welche ist bereits zerbrochen. Ist es Karma, ist es Tiefe, geht es um Ordnung als Prinzip, das mit Macht durchgesetzt wird, oder setzt Macht eine Ordnung ein? Erhält man mit Strukturen die Macht oder kann die Macht die Struktur erhalten? Oder… gibt es mehr als Macht und Ordnung? Es werden tiefe Themen werden, in einem Selbst, im Kollektiv und global. Wegsehen ist kaum möglich, Pluto versteckt sich nicht, er steht im Horoskop am sichtbarsten Punkt der Öffentlichkeit, auch wenn er aus der Sicht des Tages eher eine verborgene Kraft ist, da er am Tageshimmel nicht zu erkennen ist. Und so ist es wie diese Analogie… das Verborgene wird sichtbar, auch wenn es eigentlich unsichtbar ist, geht kein Weg dran vorbei, es wahrzunehmen. Es wird ein Weg der Innenschau, mit einem voll-energetisch aufgeladenen Vollmond. Zusätzlich zu dieser immens aufgeladenen Energie befindet sich der Dreamspell am Ende eines Spins mit Übergang zu einer neuen Runde im Tzolkin, dies potenziert die bereits vorhandene Kraft und durchsetzt sie mit der Erkenntnis der kosmischen Kräfte, dem Rufes der eigenen Seele nach Veränderung, und der angestauten Kraft des bisherigen spirituellen Weges. Der 24. Oktober, der Tag des Vollmondes, ist Kin 259, kristallener Sturm. Dies bedeutet, dass es um die kraft der Transformation geht, und der kristallene Ton ist der Ton der Kooperation. Es geht also um die kollektive Zusammenarbeit im Sinne der Transformation. Für die 68’er Generation bedeutet dies: Ihr seid nicht nur wegen den 68’ern hier gewesen. Dies ist Eure Zeit. Sowohl in der Gesellschaft als auch im Inneren wird sich das Verdrängte in den sichtbaren bzw. fühlbaren Bereich begeben, und wird nicht mehr wegzuschieben sein. Es ist eine kraftvolle Zeit, die genutzt werden will. Das Verdrängte kann verwandelt, kann transformiert werden. In dieser Botschaft möchten wir mit Euch eine einfache, aber hoch effektive Methode teilen, mit der man sich die Quantumpotenziale Eures Körpers erschließen kann. Diese Technik ermöglicht es Euch, lebensfördernde feinstoffliche Energien aus anderen Dimensionen des Bewußtseins zu Euch zu ziehen. Trilliums sind Quantenfeld-Effekte, die immer dann entstehen, wenn sich zwei subatomare Partikel treffen. Sobald die Atome beginnen, die Verbindung zwischen den subatomaren Partikeln herzustellen, werden die Quantumfeld-Effekte verstärkt. Aus dieser Perspektive ist Euer physischer Körper ein verwobener, choreographierter Generator sich miteinander verbindender und interagierender Quantumfeld-Effekte die spontan aus den Zellen Eures Körpers aufsteigen. Diese zellulären Quantumfeld-Effekte tendieren dazu, sich in exquisit koordinierte Quantum-Attraktoren zu entwickeln, die feinstoffliche Energien aus Eurer Umgebung in die Zellen Eures Körpers hineinziehen. Dieser Prozess entfaltet sich, ob man sich dessen gewahr ist oder nicht. Es ist eine automatische und reflexive Aktion der zellulären Matrix, die ihr Euren Körper nennt. Es gibt viele Seltsamkeiten und Kuriositäten bei Trilliums. Eine von ihnen ist ein Rätsel ihrer Natur. Sie operieren unabhängig der eigenen bewussten Wahrnehmung sind jedoch stark von den tiefsten Kernglaubenssätzen beeinflusst, die ihr über die Natur der Realität habt. Mit anderen Worten, Trilliums sind – auf Quantumebene – programmiert durch die unermessliche und enigmatische Verbindung (Schnittstelle) zwischen Bewusstsein und Materie. (Anm.d.Ü: im englischen Interface, die Hathoren sind hier teilweise technisch durch Begriffe, die wir u.a. in Computersprache verwenden). Zwei Individuen, die in der gleichen Umgebung leben, ziehen sehr unterschiedliche feinstoffliche Energien zu sich, die auf ihren Kernglaubenssätzen basieren. Diese Unterschiede könnten dann signifikant sowohl deren Wahrnehmung der „Realität“ (und was sie als möglich halten) beeinflussen, als auch das, was sie wirklich in der Lage sind, innerhalb dieser wahrgenommenen „Realitäten“ zu erreichen. Während Trilliums zweifelsfrei automatisch agieren und das anziehen, worauf sie programmiert wurden, sind sie doch auch sehr einfach von der fokussierten Absicht und Ausrichtung beinflussbar. Mit anderen Worten, man kann es beeinflussen, welche feinstofflichen Energien man anzieht, einfach durch den Gebrauch der eigenen Kräfte bewusster, fokussierter Absicht. Der Wert der Arbeit mit Trilliums ist es, dass man wiederherstellende, aufbauende und ausgleichende Energien anderer Ebenen des Kosmos zu sich ziehen kann. Die Fähigkeit der Trilliums, lebenserhaltende und wohltuende feinstoffliche Energien aus anderen Dimensionen heranzuziehen, die über den physischen Planeten hinausgehen, ist genau der Grund, warum wir diese Information zu diesem Zeitpunkt mit Euch teilen. In dieser Botschaft gaben wir einige Prognosen und Vorhersagen zu einigen Abläufen im Ökosystem der Erde – speziell zu dem, was Umweltwissenschaftler das Sechste Massensterben nennen. Wenn wir über das Sechste Massensterben sprechen, beziehen wir uns auch auf die Tatsache, dass ein großer Anteil von Pflanzen und Tierarten bereits von diesem Planeten durch die fünf vorhergehenden Ausrottungsepochen verschwunden sind. Aus unserer Sicht und aus Sicht vieler Umweltwissenschaftler, betretet ihr bereits das Sechsten Massensterben. Nachdem wir dies so deutlich sagen, lasst uns nun klären, dass, während das Sechste Massensterben eine Möglichkeit in Eurer Zeitlinie ist, es noch keine Tatsache ist, da jeglicher Ablauf von Ereignissen bis zum letzten Moment verändert werden kann.Wenn jedoch die Menschheit ihre Beziehung zur Natur und dem Ökosystem der Erde nicht verändert, wird das Sechste Massensterben unvermindert ablaufen. Das Sechste Massensterben wird nicht bedeuten, dass die gesamte Menschheit zerstört wird, aber es bedeutet, dass ein Großteil der Menschen betroffen sein werden. Unsere Sicht ist, dass sich in den nächsten 25 Jahren Euer Planet in eine rapide und radikale Transformation begeben wird, und damit auch Euer kollektives Bewusstsein. Die Intensität der Stürme überall auf dem Planeten wird ansteigen, was dazu führt, dass sie immer zerstörerischer werden. Ozeanpegel werden steigen, schneller als bisher angenommen. Und diese, die in flacher liegenden Küstennahen Gebieten leben, werden schneller als von Wissenschaftlern vorausgesagt in das tiefere Festland flüchten und migrieren müssen. Alle diese ökologischen Veränderungen schaffen immensen Überlebensstreß im Lebensbereich der Tierwelt und in allen botanischen Formen des Lebens wie Bäume und Diatomeen, winzig kleinen Mikroorganismen in den Ozeanen. Zusammen mit den Bäumen sind Diatomeen und andere Phytoplanktonorganismen dafür verantwortlich, den verwendbaren Sauerstoff der Erde zu bilden. Riesige Baumreserven der Erde werden von Überforstung und Abholzung bedroht und sowohl Bäume als auch die Phytoplanktonorganismen werden sowohl vom Klimawandel als auch einer weltweit ansteigenden Toxidität (Giftpegel) negativ beeinflusst, der von den modernen Technologien verursacht wird. Die Ozeane werden übersäuert, und dies ist verheerend sowohl für ozeanische als auch Land-basierte Lebensformen. Wenn das Sechste Massensterben unverändert weitergeht, wird die Mehrheit der Menschheit ein Teil der Geschichte der Erde werden. Die wenigen Arten von Menschen, die dies überleben können, werden eine andere Form von Mensch sein als das, was wir bisher kennen. Sie werden Begleiter und Verwalter der Erde statt deren Herren sein, und ein kollektives Verständnis für die Notwendigkeit von Kooperation wird in ein jedes Bewusstsein eingetrieben worden sein. Die Unterschiede zwischen Menschen in Bezug auf Kultur und Religion werden weit weniger wichtig sein als es heute ist. Das resultiert aus der Tatsache, dass der Mensch, um zu überleben, die Unterschiedlichkeiten beilegen muss, um einen neuen gemeinsamen Boden zu finden (wir meinen dies übrigens sowohl übertragen als auch wörtlich). Diese neue Art von Mensch wird also durchlässiger und offen für andere Dimensionen des Bewusstseins sein. Dies bedeutet, dass zukünftige Menschen sowohl einen direkten bewussten Kontakt mit anderen Wesen galaktischen oder intergalaktischen Ursprungs haben (z.B. Aliens) als auch mit nichtverkörperten Intelligenzen wie Engel oder andersartigen Energiewesen. Gegen Ende dieses nächsten Vierteljahrhunderts wird ein wachsender Prozentsatz der Menschheit galaktische Erkundungen durchführen, und die Menschheit wird ebenso eine Raumfahr-Zivilisation werden. Es wird sicherlich eine seltsame und merkwürdige Zeit sein, um am Leben zu sein, da einige Menschen vorhaben, den direkten schweren ökologischen Veränderungen der Erde zu entfliehen. Gleichzeitig wird es andere geben, die sich verpflichten, ein erdgebundenes Leben zu leben, und diese neue Art von Menschen wird neue, kreative Wege finden, sowohl zu Überleben, als auch sich fortzuentwickeln und zu wachsen. Diese neuartigen Formen der Interaktion mit einer sich verändernden Erde werden neue Klassen und Arten von Nahrung und Medizin hervorbringen, die bisher noch nicht geschaffen wurden. Um zum Fokus für die nächsten 25 Jahre zurückzukehren, es werden in den meisten Teilen der Welt zwangsläufig sowohl Nahrungsknappheit auch Wasserknappheit aufgrund der Veränderungen im Klima entstehen. Aufgrund des Stresses auf alle biologischen System und als Ergebnis der Schädigungen in sowohl der Wasser als auch der Luftqualität werden Euren Nahrungsquellen, Wasser- und Sauerstoffversorgung zunehmend Vitalität entzogen. Mit anderen Worten: es wird zunehmend schwieriger, genügend Nährstoffe und Lebenserhaltendes aus dem Erdumfeld zu extrahieren, auf das die Menschheit in den letzten Tausenden von Jahren vertrauen konnte. Trilliums sind eine Möglichkeit für Euch, andere Quellen der Lebenserhaltung zu gewinnen, die in anderen Dimensionen der Existenz außerhalb der jetzigen Realität der Erde ihren Ursprung haben. Und sie sind eine Möglichkeit, die Zellen Eures Körpers eine Art Nahrung und wohltuende Energien zuzuführen, die euch stärken kann. Interessanterweise kann diese Energie viele Formen annehmen, inklusive Manna, eine formbare Nahrungsquelle, die sowohl im Alten Testament als auch im Koran als außerweltlichen Ursprungs erwähnt ist. Es ist eine gute Fähigkeit, Eure Trilliums gemeistert zu haben, wenn ihr tiefer in die chaotische Natur Eurer planetarischen Transformation eintretet, die vor Euch liegt. Das Schwierigste an Trilliums ist ihre Einfachheit. Ihr „TUT“ nichts um sie zu aktivieren, da sie sowieso schon 24 Stunden am Tag aktiv sind. Alles was ihr tun müsst, ist es, jene Energien zu qualifizieren, die ihr zu Euch ziehen wollt, und dies tut ihr ganz einfach, in dem ihr den Fokus auf diese Absicht legt. Wenn ihr z.B. mehr Vitalität oder vielleicht wiederherstellende / heilende Energien braucht, tretet einfach in einen entspannten mentalen Zustand ein und werdet Eures ganzen Körpers in dem Verständnis gewahr, dass jede Zelle ein Quantum-Attraktor ist. Sobald ihr Euch mit dieser gewählten Intention verbindet, werden die Trilliums in Eurem Körper beginnen, Energien von anderen Dimensionen des Kosmos zu sich zu ziehen. Wenn Euer Verstand und die Gedanken umherschweifen, bringt sie einfach zurück, in dem ihr Euch erneut auf Euren Körper und die gewählte Absicht fokussiert – mit dem Verstehen, dass diese einfache Handlung der fokussierten Absicht Eure Trilliums verbindet. Wir ermutigen Euch, damit zu experimentieren, in dem ihr viele verschiedene Arten positiver, lebensfördernder, feinstofflicher Energien zu Euch zieht, die ihr in der zellulären Matrix, die Euer Körper ist, erfahren wollt. Ihr werdet immer effektiver im Zugang zu den Potenzialen der Trilliums werden, wenn ihr einen veränderten Bewußtseinszustand einnehmt, da diese Fähigkeit in einer Domäne außerhalb der üblichen menschlichen Wahrnehmung liegt. Wir haben die “Trillium Sound Meditation” geschaffen, um Euch darin zu unterstützen, Eure Wahrnehmungsrealität zu verändern, und ein Link zur entsprechenden Audio-Datei ist am Ende dieser Nachricht beigefügt. Die Aktivierung Eurer Trilliums wird um so effektiver und kraftvoller sein, wenn ihr Euch ebenfalls in einen Zustand kohärenter Emotionen und Fühlens wie z.B. Wertschätzung und Dankbarkeit begebt, während ihr Euch in der Klangmeditation befindet. Statt zu erklären, warum dies so ist, verweisen wir Euch auf eine frühere Hathorenbotschaft mit dem Titel: die Multiversum Sound Meditation, die ihr im Hathorenabschnitt der Website von www.tomkenyon.com findet. Wir wünschen Euch viel Erfolg in Euren Erforschungen der Trilliums. Es ist, wie wir glauben, das größte Geschenk, dass wir Euch zu dieser Zeit geben können. Möge dieses Wissen ein Segen sowohl für Euch und die, die ihr liebt, als auch zum Wohle aller fühlenden Wesen sein, während alle von Euch kollektiv die Schwelle zu einer größeren Planetarischen Ungewissheit überschreitet. Persönlich finde ich das Wort Metamorphose ganz speziell passend, da der Begriff, der verwendet wird, sowohl “Transformation” als auch “die Form wandeln” bedeutet. Eine oberflächlicher historischer Blick auf das Leben auf der Erde enthüllt klar, dass wir in der Mitte radikaler Transformation sind. Und die Form des Lebens (damit meine ich, wie wir das Leben leben) ist sich fraglos am Verändern. Teil dieser Veränderung ist, dass wir uns als Weltkultur psychologisch immer stärker von der Natur trennen. Die Effekte dieser Trennung von unserem natürlichen Ursprung tragen zu einer kollektiven Nichtbeachten der Natur mit unheilbringenden Konsequenzen für alles biologischen Lebens (uns inklusive) bei, es sei denn, wir ändern unser soziales Verhalten und die Einstellung in Bezug zur Natur. Ich werde nicht die Vorhersagen der Hathoren diskutieren, die die nahe Zukunft der Erde betrifft, da ihre Kommentare selbsterklärend und auf den Punkt gebracht sind. Ich denke, an diesem Statement ist viel Wahrheit, wenn es darum geht, jegliche persönlichen Muster zu erkennen, sei es eine eher persönliche psychologische Tendenz, eine soziale Norm oder unser gegenwärtiger Sumpf in Bezug zum beschleunigt sich verändernden Ökosystem. Die Hathoren waren von Anfang an ihrer Kommunikation mit mir seit den späten 1980’ern sehr klar, dass in Bezug auf die spirituelle Evolution die Ereignisse oder externen Situationen im Leben nicht so wichtig sind wie die inneren Entscheidungen, die wir treffen. Ihr Standpunkt ist es, dass die Entscheidungen, die wir in Bezug zu den verschiedenen Herausforderungen des Lebens treffen, die tieferen Ebenen unseres Bewusstseins formen, und diese inneren Attribute werden es entscheiden, wo wir in folgenden Inkarnationen auftauchen. Mit anderen Worten: unsere Wahl bezüglich unseres jetzigen Lebens wird direkt sowohl die Qualität unserer Erfahrungen als auch die Möglichkeiten und Chancen die uns in anderen Leben geboten werden, beeinflussen, egal ob diese in den Welten der Materie oder in den Lichtreichen getroffen werden. Von dieser Perspektive also gesehen bietet uns das moderne Leben mit den anstehenden Unsicherheiten und Chaos eine nie zuvor dagewesene Möglichkeit, sehr schnell im Bewusstsein zu wachsen und aufzusteigen – wenn wir jene Entscheidungen treffen, die den Aufwärtsschub unseres Bewusstseins fördern. Mit diesem gedanklichen Fokus möchte ich auf einige Dinge der Hathoren Einführung in die Trilliums hinweisen. Erstens: es gibt eine botanische Art von mehrjährigen blühenden Gewächsen, die man Trillium nennt, aber diese haben keinen direkten Bezug zur Bezeichnung, die die Hathoren verwenden – außer dass diese Pflanzen auch Quantum Attraktoren haben, wie alle biologischen Organismen. Es gibt einige herausragende Punkte, die man beachten sollte, wenn man sich dieser Arbeit widmet. Die Hathoren empfehlen sehr, dass man sich in eine kohärente Emotion begibt, wenn man sich auf die Trilliums einläßt. Seit ich die Trillium information in Vorbereitung für das letzte Hathor-Event bekam, habe ich mit den Trilliums auf viele verschiedene Weisen und in verschiedenen Situationen gearbeitet. Und ich kann von meiner persönlichen Erfahrung aus sagen, dass meine Trilliums sich stark verbessern, wenn ich in einer kohärenten Emotion bin. Viele von uns leben in verschiedenen Emotionalen Nischen, die darauf basieren, was wir im Moment erfahren. Wenn man die Welt und sich selbst vom Standpunkt einer inkohärenten Emotion (wie Angst, Feindseligkeit, Traurigkeit oder viele andere Formen emotionaler Inkohärenz, denen wir als Menschen ausgesetzt sind) sieht, könnte man es als schwierig empfinden, sich mit den Trilliums auf richtige Weise zu verbinden. Und, als Ergebnis, wird man nicht in der Lage sein, wie gewünscht aufbauende Energien aus dem Kosmos zu sich selbst heranzuziehen. Daher gilt als ersten Schritt, wenn man sich mit den Trilliums verbindet, sich ehrlich anzuschauen und zu bestimmen, wo man sich gerade emotional befindet. Dieses Selbsteinschätzung beruht übrigens auf Pragmatismus und hat nichts mit Selbstkritik zu tun. Aufgrund unserer Natur sind viele von uns Subjekt für alle Arten inkohärenter Emotion, und die schnellen Veränderungen in unserer Welt tragen in vielen Fällen zu einer steigernden Inkohärenz bei. Unsere Aufgabe ist es, zu erkennen, in welchem Zustand wir sind, und wenn dies eher inkohärent ist (z.B. negativ), dann findet einen Weg zu einem kohärenten Zustand. Die Hathoren besprechen dies in einem ihrer früheren Botschaften mit dem Titel: „Die Multiversum Klang Meditation“. in dieser Kommunikation wird eine Methode beschrieben, wie man sich willentlich in einen kohärenten Zustand bewegt. Ihr könnt also diese Methode in Ausführlichkeit beschrieben finden, wenn ihr auf die „article“ Sektion geht, und den Titel: Appreciation and Gratitude: A Basic Primer auswählt. Der zweite und letzte Punkt den ich in Bezug zu Trilliums machen möchte, ist, dass dieses Zu-Sich-Heranziehen wohltuender und aufbauender Energie eigentlich ein passiver Zustand ist. ihr „TUT“ nichts um die Trilliums zu aktivieren da sie immer Energie aus der Umgebung zu sich ziehen und in die Zellen des Körpers geben. Um in dieser Arbeit effektiv zu sein, ist alles, was man tut, die Gedankenform oder Absicht zu halten, welche Energien man in den Körper ziehen möchte. Dies geschieht nicht durch Konzentration, die im besten Falle kontraproduktiv wäre. Der Grund dafür ist, dass Konzentration eine Art mentaler Spannung erzeugt, und Trilliums sich am besten aktivieren, wenn der Verstand sich wohlfühlt und einfach nur eine Absicht sanft hält. Ironischerweise ist die Einfachheit, mit der man sich mit den Trilliums verbindet, der schwierigste Teil davon. Viele von uns sind es gewohnt, hart an etwas zu arbeiten, um etwas geschehen zu machen. Aber wenn es an feinstoffliche Energien geht (wie Trilliums), gilt: ist je weniger Aufwand/Bemühen, desto besser das Ergebnis. Beachtet: Ein Excerpt der Trillium Klangmeditation, die zuerst im letzten Hathor Workshop 2018 verwendet wurde, ist unter dem “Listening” Abschnitt gepostet. Dieses Klangfeld ist sehr hilfreich, wenn man mit Trilliums arbeitet, und ist für den persönlichen Gebrauch kostenlos zur Verfügung gestellt. Ihr könnt den Link zu diesem Audio-file am Ende meines Kommentares finden. Dieses Klangstück ist 5:53 min lang. Da ich mit dieser kurzen Version auch gearbeitet habe, kann ich sagen, dass es mehr als genügend Zeit ist, die Trilliums, wie es die Hathoren beschreiben, zu aktiveren. Alle die in der Empfänglichkeit der Trilliums bleiben möchten: ihr könnt durch die Aktivierung der Wiederholungsfunktion die Laufzeit des Stückes verlängern. Jene von Euch, die mit den früheren Aufnahmen vertraut sind, erkennen die Basisaufnahmen für die Trillium-Sound-Meditation, die “Worlds Ascending” die zuerst auf der CD “Ascension Codes” erschien. Der Unterschied zu diesem Stück ist, dass höherdimensionale Hathoren – bekannt als der Aethos – zusätzlich auf die Originalaufnahme singen, was es akustisch sehr ungewöhnliches und energetischer macht. Die Trillium Klangmeditation befindet sich in der “listening” section unter www.tomkenyon.com. Wenn ihr diese Nachricht von uns erhaltet habt, könnt ihr auch auf den Link weiter unten im Text klicken, und ihr werdet zu der „listening“ section geleitet. Wenn ihr die Listening Bedingungen akzeptiert, habt ihr sofortigen Zugang zu einer Plethora von Klangmeditationen, Vorträgen, Interviews, und all dies kann für den persönlichen Gebrauch angehört, oder downgeloaded verwendet werden. Scrollt einfach nach unten zur Auflistung bis ihr den Titel „Trillium Sound Medition Excerpt“ findet. Hier klicken um die Trillium Sound Meditation zu hören oder zu downloaden. Ihr könnt diese Nachricht in allen Medien und in jedem Format teilen, sofern dies kostenlos geschieht, nicht verändert wird in Inhalt oder Ausrichtung, der Autor gewürdigt wird und die gesamte Copyright-Vereinbarung zitiert wird. Bitte beachtet, dass diese Erlaubnis nur das geschriebene Wort betrifft, und nicht die Klangmeditation. Die Aufnahmen des letzten Hathorenworkshops “The Art of Psycho Navigation Spatial Cognizance” sind nun als CD und mp3 erhältlich. Der Titel des Workshop sets ist „Multiversum“ den man im Webshop unter www.tomkenyon.com findet. Dieses Set an Aufnahmen beinhaltet die komplette Trillium Sound Meditation. Anmerkung: Nachdem ich diese spezielle Hathorenbotschaft erhielt, forschte ich etwas und recherchierte verschiedene Studien zu Umweltthemen, und entschloß mich, vier (4) unterschiedliche Artikel zu teilen. Für alle, die Informationen vermeiden wollen, die sie emotional verstörend finden, empfehle ich, diese Artikel NICHT zu lesen, da sie ein sehr bedrückendes Bild unseres Planetarischen Ökosystems zeichnen. Am 27. Juli 2018 veröffentlichte der US Congressional Service einen Bericht mit dem Titel: Changes in the Arctic: Background and Issues for Congress. (Veränderungen in der Arktis, Hintergründe und Themen für den Kongress) Dies ist eine extensive Studie die viele der Herausforderungen und Möglichkeiten in der Arktis beschreibt. Heute am 30. September 2018 beginnt die Adlerwelle im Dreamspell. Es sind nur noch 25 Tage bis zum Ende des jetzige Tzolkin-spins (zu sehen an dem kleinen Tzolkinbild). Es ist eine Blaue Welle, sie geht in 13 Tagen in die Gelbe Sternenwelle über, von der Valum Votan / José Argüelles sagte, dass wir die Treppen zum Smaragdturm erklimmen. Doch zurück zum Hier und Jetzt: worum geht es in der Adlerwelle? Ich beschreibe mehrere spezielle Fokustage, an denen sich die Absicht einer Welle so zeigt, dass die Energiewelle als ganzes verstanden werden kann. Jede Welle in sich ist eine ganze Einheit, eingebettet in die gesamte Umdrehung von 260 Tagen, die ein holografisches Abbild des ganzen darstellt. In den ersten 7 Tagen der Welle baut sich die Energiewelle von uns selbst ausgehend zu einem Momentum auf, erreicht am 7 Tag das Herz / das Zentrum der Energie und geht in Resonanz mit allem was ist. Von dort aus erreicht sie im 8. Ton das Galaxtische Zentrum, im 9 erreicht die gesamte Energie mit Antwort die Sonne, um am 10. Tag sich auf der Erde zu manifestieren. Danach fächert sich die Energie in das ganze Spektrum auf, einzelne Zeitlinien oder Energieresonanzen werden gebildet, so dass sich im 12. Ton jene Gruppen, Energien oder Themen finden, die kooperieren. Der 13. Ton ist dann das kosmische Fenster, die kosmische Energie, das volle Potenzial, dass die Welle in diesem Fokus erreichen kann in den Fenstern und Portalen von Zeit und Raum. die manifestierende Energie im 10. Zeichen. Worum geht es in der Manifestation dieser Energie? Welches Ergebnis sollte erreicht werden Um was geht es wirklich? der Spektrale Tag: welches Spektrum hat die gesamte Energie, wie fächert sie sich auf, welche Ausmaße hat sie, welche einzelnen Energiewege oder Themen gibt es, wie tragen die 7 Strahlen die Energie weiter bzw. welche Seelengruppen erhalten Aktivierungen. der 12. Ton: Welche Zusammenarbeit formt sich? Sind es Gruppen, die sich bilden? Welche Seelenfamilien werden erreicht? oder findet in der Energie selbst ein Formen zu Gruppen statt? Wozu wird kooperiert, welches gemeinsame Ziel kann erreicht werden? der 13. Ton: welches kosmische Portal öffnet sich? Welche Energie oder wer ist kosmische Energieträger dieser Welle? Zu welchen Ebenen oder Dimensionen kann man durch diese Wellen aufsteigen oder erreichen? Welche Portaltage hat die Welle? Nachdem also die Sprache und der Atem erneut in den Fokus gerieten und wir dieser Energie gewahr wurden, die der göttlichen Bewegung der Absicht der Lebenserhaltung auf der Erde dient, erreichen wir die Vision „Gottes“ – panorama-Bewusstsein von „Allem was ist“. Wir verbinden uns mit allem was ist und dem Willen zum Leben, und was diese Energielinie an Entwicklungen bereithält. Welche Absicht und Zielsetzung sie hat. Der Adler als Krafttier bringt die Gesamtsicht, die Übersicht, den Panoramablick und das Bewusstsein, die man im Überflug aus großer Höher erhält. Der Adler kann sich aus großen Höhen schnell herabstürzen, um seine Beute zu jagen, und mit ihr wieder in große Höhen zu entschwinden. Seine Nester sind meist in großen Höhen auf Felsvorsprüngen gebaut. Der Adler ist ein Wesen der Höhe, nur zur Erde herabkommend, wenn es nach Beute aus ist. In der Adlerwelle liegt daher die Möglichkeit, dieses Panoramabewusstsein zu entfalten. Sich ein wenig – oder mehr – von den Alltagssorgen und –nöten zu lösen, um sich in dieser Losgelöstheit einen Gesamtüberblick zu verschaffen. In einer Welle manifestiert sich die Energie im 10. Ton – auf den Adler bezogen, welche Fähigkeit fokussiert man mit Adlerblick, was verfolgt man, welche Beute möchte man, um welchen größeren Gesamtzusammenhang geht es? Dies ist der „Samen“. Es geht in der Adlerwelle also um die Vision, in welchem Zusammenhang mit welchem Samen eine Aktion steht. Setzen wir in diesem Leben neue Saaten oder sehen wir Saaten aufgehen? Welche Jahreszeiten sind es, welche Saaten sollten aus dem Gesamtzusammenhang gesehen aufgehen? Was braucht die Erde, das Leben, welche Samen trägt die Gesamtgesellschaft? Wenn wir den Gesamtzusammenhang sehen, in welchem Bezug dazu steht dann das eigene? Wenn wir uns ein wenig von unserer täglichen Routine lösen können, steht die Frage im Raum: Wollen wir so weitermachen? Wohin bringt uns das (Ernte)? Möchten wir uns neu orientieren, Dinge der Ausrichtungen ändern? Möchten wir uns nach etwas Größerem ausrichten? Die Kooperation in dieser Welle erfolgt durch den Weißen Weltenüberbrücker, Keme, der ein Synonym für den Tod darstellen kann. Nicht alle Saaten haben wir in diesem Leben gepflanzt, manche kommen aus früheren Leben. Manche kommen aus anderen Leben (z.B. Ahnen), oder vorangegangenen Generationen. Manchmal ist das, was wir tun, größer als das eigene Leben, und wir sehen die Früchte dessen nicht mehr. Oder: die Probleme müssen sterben, das Ego muss sich von Dingen, Projekten, überflüssigem lösen. Wenn der Panoramablick ergeben hat, dass wir uns gerne umorientieren, hat das viele kleine Tode zur Folge, da man einiges an Themen und Projekten loslässt. Das Leben kooperiert also mit der Vision des Adlers durch Loslassen. der 13. Ton, das kosmische Fenster, das ermöglicht wird, ist die „Hand“. Die Handlungen die wir tun, die Handlungen derer wir fähig sind, erreichen kosmische Ausmaße. Wir sind nicht mehr länger erdgebunden in den Aktionen, die wir machen, sondern wir realisieren, dass die Handlungen weitreichende Folge haben, kosmische Wellen und Energie freisetzen. Oder kosmische Energien kommen und unterstützen die eigenen Handlungen. Weisheit in den Handlungen, handeln in der korrekten Energie mit Fokus auf die Vision, die es zu erreichen gilt, ist also das kosmische Portal. Die Hand steht jedoch noch für etwas anderes: wenn man Daumen und Zeigefinger zusammenlegt, erhält man die größe der eigenen Pranaröhre. In der Hand geht es also um die Aktionen, die Lebenenergie , Prana in sich tragen. Die dem Leben fördernd, zutragend sind. Die die eigene Energie und die Energie anderer stärken. Wer das Glück bzw. die Möglichkeit hat, die Artikel und das Buch zu lesen, wird feststellen, dass sich viele Übungen auf den Aufbau und den Erhalt der pranischen Energie beziehen. Die Prana-Energie ist es, die Klarheit bringt. Wenn der Körper zu wenig dieser Energie hat, können Unklarheiten oder Unwohlsein die Folge sein. Klarheit, auch in Gedanken, tritt ein, wenn sich das Prana aufbaut. Dies kann u.a. durch Aufenthalte in der Natur oder beim Bewussten Atem erlebt werden. Daher geht es also in der Adlerwelle auch um das eigene Energiefeld, das den Adlerblick ermöglicht. und der Adlerblick ermöglicht es, zu erkennen, was an Energie man hat oder braucht, um etwas zu erreichen. Es geht darum, zu erkennen, dass man soviel Energie hat, wie man gesät hat (durch das Leben) bzw. zu erkennen, wie man Energie weise nutzt, um das Leben und die Vision zu leben. Es gibt in dieser Welle zwei Portaltage: der oberton Sturm (Kin 239 am 04.10.2018) und der spektrale Drache (kin 241 am 10.10.2018). Der Oberton eines Klanges ist der Klang in der ganzen Fülle, doch oft sind es die Ober- und Untertöne eines gesagten, die das Ergebnis oder die Reaktion beeinflussen. Die Obertöne und die Intention, die Absicht, die wir verfolgen, erschaffen also einen Sturm der Transformation im Leben, der der Vision zur Umsetzung verhilft. Diese Transformation wiederum unterstützt Handlungen, transformiert Denken und Handeln auf allen Ebenen und Zeitlinien. Der Spektrale Ton gibt das Spektrum einer Energie an, hier durch einen Portaltag des roten Drachens besetzt. Kin 241, roter spektrale Drache. Die Drachenenergie ist aus meiner Sicht eine alte Verankerung mütterlicher Energie auf der Erde. Geomantisch gesehen gibt es Drachenlinien, die spezielle Orte direkt mit kosmischen Energien versorgen und zu anderen Dimensionen führen. Wenn die Vision des Adlers also die Samen als Manifestation erreicht, sind als volles Spektrum alle Energien bis hin zur Gründung- und Formungszeit der Erde möglich. Meine Träume verändern sich, wenn ich Visionen globaler Art habe. dies ist meist der Fall am Anfang und am Ende einer Welle, des gesamten 260 spins des Tzolkins, der Jahreswechsel und die Portaltage. Mein Traum heute Nacht zeigte mir die pranische Sicht der Erde: Lebenskraft. Meine Träume waren voll von Gewittern und unglaublich großen Stürmen mit riesigen Wassermengen und elektrischen Entladungen. Eine elektrische Überladung und Imbalance im Energiefeld führte zu extremen Gewittern und Entladungen, die die Kommunkationstechnik betrafen. Es war eine Zeit, unterschlupf zu suchen. Das zweite Traumbild zeigte eine harmonische Szene an einem großen Fluß. Menschen saßen in der Sonne, die freie Natur genießend, während vor ihnen s ein großer Strom (Energie) an ihnen vorbei floß. Und so geht es vielleicht um die beiden Möglichkeiten. wenn mit der kosmischen Energie im Einklang und lebenserhaltende Aktionen und Werte die Vision und Handlungen ausmachen, können die Energien wie in einem ruhigen Fluss wahrgenommen werden. Doch im außen – und wenn die inneren Energien nicht ausgerichtet sind, drohen Überladungen, Stürme und Naturkatastrophen. Als persönlicher Rat: Handy und PC ausschalten und sich in die Freie Natur begeben, so dass sich das Energiefeld von den elektrischen Geräten erholen, und auf die Erdenergien einschwingen kann, so dass genügend Prana aufgebaut wird. Möge es ein visionsreicher Flug sein! Eagle Wavespell / the energies from 30. Sep – 11.Oct 2018. 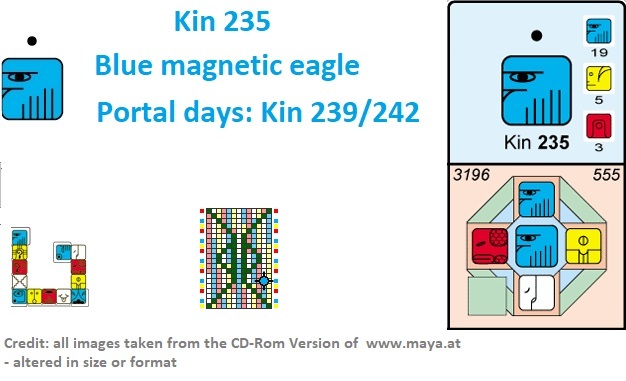 25 days to go to the end of the current 260 day spin, which can be seen on the small miniature Tzolkin. It is a blue wavespell that starts, and in 13 days, the yellow star wave will lead to the end of the current spin. In the wording of Valum Votan / José Argüelles, we will climb the stairs to the emerald tower during the star wave. Yet back to the here and now: what is the Eagle wavespell about? I describe special points in the wave, in order to give an impression of the hidden, background energetic. In the first 7 days of the wave, we start with thoughts and actions to build a momentum. On the 7th– the resonant day, the energy reaches the middle of the wave, starts to be in resonance with the greater whole. In the 8th tone it communicates with the galactic center, in the 9th with the solar energy, and then manifests on Earth. So I describe special points in the wave, for they are usually quite clearly to see and provide an understanding of the own energy in the whole. the manifesting energy in the 10th seal, what is the manifestation about? What outcome shall be reached? the 12th tone: what is the cooperation about? who is cooperating or what for do we cooperate? the 13th tone – to what cosmic energy doorway leads this wavespell. What or who is the cosmic energy in this wave, to which layers and dimensions can one climb through that wave. The starting impulse of the wave is the eagle energy. The eagle is about the vision. Remember, we came out of the breath wavespell that aligns us with the breath of god, that can be the words we speak, or the air we breathe here on earth. So after realizing this breath of god, the divine movement of intention and life sustaining, we reach the vision of god. in breathing in and out, we get aligned with the “all that is” will to live and what line of development it may follow, what intention it has. On the personal level this may show in dreams or clear knowing and insight about the own flow of attention in life, the own focus, of inner longings, projects, what may lay ahead. 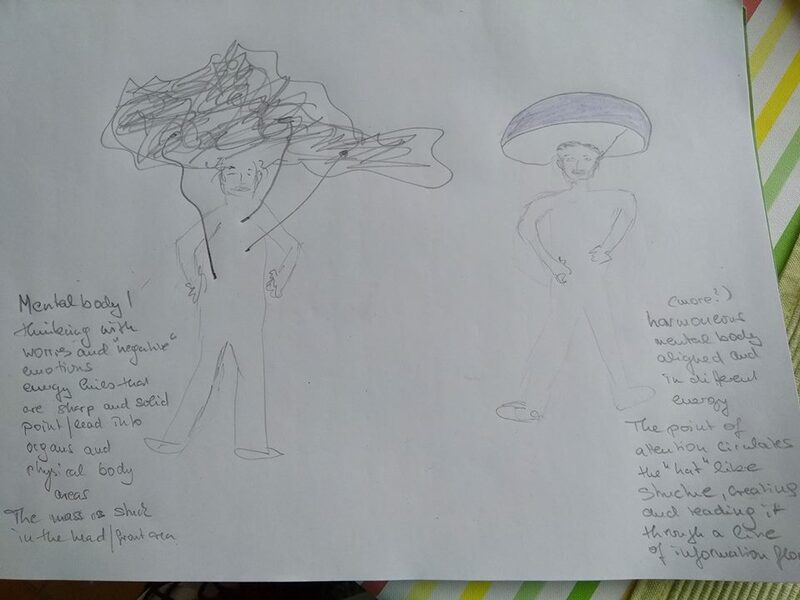 One may gain the overall view on the own circumstances, sudden views of interconnectedness like e.g. small streams tand creeks mount into other flows, and form a larger iver. The Eagle as animal totem is the overall view, the panoramic awareness one can gain in the flight, soaring high. the eagle is able fall down from this height with absolute focus in order to get its prey, and then climb up into the air again with its food. It nests are usually high in rocks or trees, it is a being of the height, only climbing down touching earth if it needs food. In the wavespell of the earth it may therefore be a focus on panoramic awareness , one can gain if detached from the ground, detached from the daily human issues. In a wavespell, the manifesting energy is the tenth tone. In this wave, it shows what the ability of the eagle is focused upon. Maybe even what prey it may get. The planetary tone of manifestation, the prey, the eagle looks for to feed itself, is the „Seed“ energy. What seeds did we plant in soil, what seeds we are about to plant, if we get the overall picture? Do we change our life and our life strategy, the direction life takes, if we get the overall picture? De-tached at least a bit from the daily sorrows and worries, if we soar at least a bit into the air and sky, do we then change our seeds, our deeds, our thoughts, our intention to something bigger, that suits the panoramic awareness? The cooperation in this energy is the white worldbridger, Keme, which is one synonym for death. not all seeds we plant in this life, not all plants we harvest in this one. sometimes we have to die to be reborn, sometimes the ego has to die. or the problems have to die. the cooperation Is the letting go energy. Once we may get the overall picture, we realize, that some stuff isn’t worth it, so we let go of it. ‚Or we may see, other things are more important, so we re-organize our lives. The actions we do, the actions we are capable of, get cosmic in energy. we are no longer earth bound in the actions we take, but the energy an action carries influences and we get cosmic energy adding to our actions, so they have more impact. Yet the hand stands also for something else. if you combine the thumb and the index finger, as seen in the symbol of the hand, you get the size of your own pranic tube. So the hand is also about the energy you put into it, and the pranic energy you build up. The prana that each being is carrying needs to be taken care of, by wise action, and then it shows through wise action. If the pranic energy, the energy that is building the light body and the energy field / aura around us, is well, the mind is clear and sharp. if the pranic energy gets out of focus, one can get dizzy or unclear. If you have the chance and luck to read the book on the Hathors by Tom Kenyon, you see, that a lot of their excercíses focus on building up and maintaining the pranic energy in a being, in order to stay clear, focused, and bright and aware to the cosmic information pouring in. So in the Eagle wavespell it is about this energy field, that enables then the view of the eagle, and the view of the eagle enables a being to build up its energies, and use them wisely according to the seeds that are planted, that need to be planted, in the energies here up to the very ancient roots this planets is having. In this wavespell there are two portal days. the Storm, kin 239, the overtone storm, is a portal day. The overtones of a sound, the energies that are also there, next to our intention and purpose, make a portal and create a storm that can help transform thoughts and actions on all levels and timelines. The spectral tone, the spectrum of the energy, is the other portal day in this wave. Kin 241, the red spectral dragon. Earth herself has various dragon lines, and somehow this energy describes a very ancient motherly energy on Earth herself that connects to the cosmos. So the range of the panoramic awareness, the spectrum to which it breaks itself down in the spectral tone, is the ancient energy of earth as a whole, to the portals of the dragon energies she carries. usually in Dreamspell I get a vison at the end and / or at the beginning of a wave. This night – again – I had dreams of harder times to come, regarding electricity. I had various dream scenes of huge thunderstorms with electric lightnings that are far beyond in energy as we had so far in the past centuries. Huge amounts of rain flodded earth in large thunderstorms. the lightnings put out electricity and mobile communication, therefore disrupting our outer telecommunication system. Also the energy fields of people were charged with energies that was hard to deal with. yet the visions had also a softer scenery, people that sat on the bank of a river that was flowing like a vast stream, enjoying the flow of energy. or it may be like a vast discharge, if the energy system is not ready for it, or if ruptures in the energy on inner and outer occur. in that it is wise to take shelter and to wait until the storm had passed, and my advice is to shut down technical devices, so to shut down PC and Mobile technology wherever possible, but especially when on the outer or in a storm. Heute, 29.September, ist Michaeli, der Tag, der Erzengel Michael geweiht ist. Im Dreamspell ist heute der weiße kosmische Magier, der weiße Magier, der in die Geheimnisse des Kosmos eingeweiht wurde, und mit weißer Magie wirkt. Der kosmische Magier ist das Ende der Wind-Welle, mit dem Wind als Zeichen des „Atem Gottes“, das auf einer Seite als Wort und Sprechen übersetzt werden kann, auf einer ande ren Ebene als „Atmen“ – und damit dem Thema Sauerstoff und unser Verhältnis zu Bäumen auf der Erde betont. 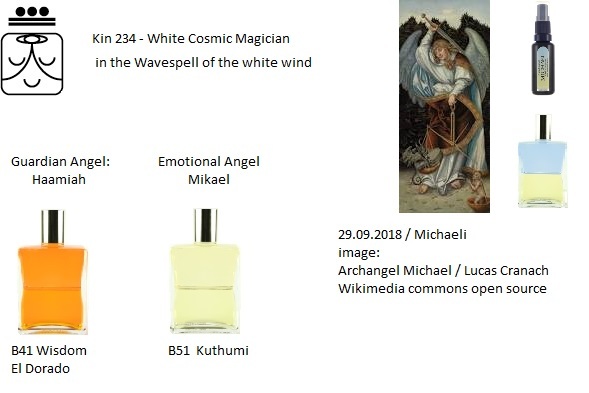 In der Tradition der 72 Engel der Kabbalah ist es der Tag des Emotionalengels „Mikael“. Interessanterweise bezieht sich Rudolf Steiner im Zusammenhang mit Erzengel Michael auf den Atemzyklus der Erde. Today, 29th September, is the feast of Archangel Michael, called „Michaeli“. In dreamspell it happens to be the day of the white cosmic magician, the white magician in the energy of the cosmos, initiated into the cosmic forces, providing them, moving and acting in them in white magician manner for the wellbeing of life and all that is. it is the end of the wind wavespell, wind reflecting the breath of life, the breath of god, may it be the word as in speech, or the breath that human take on earth, so our relation to trees and nature. 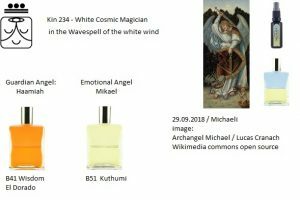 It happens to be also the day of emotional angel „Mikael“ in the tradition of the 72 angels of the kabbalah. If you apply the wisdom of Rudolf Steiner, this day is a special day in the cosmic breathing cycle of Earth. On the feast day of Michaeli, the Mercury energies mix with the sulphuric energies of the dragon power. anbei eine Zeichnung von Mentalkörpern. die erste neutrale Figur zeigt einen Menschen, in dessen Kopf eine sehr dunkle scharfkantige sich ständig bewegende Wolke steckt. Diese Wolke ist direkt mit dem Körper verbunden durch sehr kantige fast metallene solide Strukturen, die fest im Körper stecken, zum Teil in Organen, meistens mindestens eine in der Herzgegend. Die sich bewegende Wolke schießt Energie durch diese Kanäle in den Körper. ich dachte mir, als ich das sah, dass die Organe auf Dauer keine Chance haben, und krank werden können.als krank zu werden. The new moon occurs on 17.00.16 degrees of Virgo, such a tight exactness, that I rather give out two Sabian symbols. Usually, a Sabian symbol of the degree that is following is given out. As we do not have a symbol for 0 degree of a sign, and as the planet, when it enters a sign, is in that energy, we always refer to the energy of the degree where the symbol is full. PHASE 167 (VIRGO 17°): A VOLCANIC ERUPTION. KEYNOTE: The explosive energy of long-repressed contents of the subconscious. We are dealing here with the dramatic release of energies which have been kept in check by the outer shell of the ego controlled consciousness. It may be a spectacular catharsis, but it often takes paths of destruction. Yet unless some form of purification by fire is experienced, the inner pressure of the karmic past or of more recent frustrations would shake up perhaps even more destructively the very foundations of the personality. At this second stage, the objective confrontation with an image of the karmic past is replaced by a subjective irruption of repressed memories and primitive cravings. Everything must be released from the psyche seeking to attain the transfigured state. The soul must become empty, the mind translucent. The Keyword is EXPLOSION. PHASE 168 (VIRGO 18°): A OUIJA BOARD. KEYNOTE: The ability to contact deeper recesses of the unconscious psyche and sensitiveness to psychic intimations and omens. The ouija board is to be considered here a modern device similar to many ancient instruments used for divination and prophecy. Certain states of threshold consciousness are stimulated by such a use, and what the experience produces may vary greatly in quality and in origin. The release of unconscious material has lost the explosive force pictorialized in the preceding symbol, yet at this stage there is still no conscious and willful control over what reaches the ego-consciousness. This is the third stage of the thirty-fourth sequence of symbolic phases in the life process. It is at best a stage of transition which stresses a passive openness to the unknown. The glamour of it may subtly pervert the mind of the aspirant; but in some cases, this can be the first manifestation of INNER GUIDANCE. The difficulty is to correctly evaluate what or who does the guiding. in the other symbol, inner guidance emerges. The quality of that guidance is up to the person, circumstances, and the clarity of awareness. The inner guidance may emerge through using tools or devices, and one needs discrimination to be aware of quality of message and messenger, yet, it is a slower emerging. in the first symbol, something just breaks loose, in the second (the one we would actually take) something emerges by effort and slowly, as we ask for it to happen, seeking for it. in one stage therefore the possibility of outbreaks and outbursts of (unwanted) energy, on the other hand the awakening of something, that was trained and asked for. In the first symbol it represents the setting free of old energy that was blocked, suppressed, not worked with (in a training or forwarding intention) – the other – actual- symbols shows the turning towards the future, the seeking into something. Due to this I show two horoscopes, both calculated on manmade places. the first one shows the energy on the International-Date-Line, the other one for the 0 Longitude of Greenwich, where all time is calculated (Universal time UT as well as GMT start at Greenwich astronomy observatory near London). Due to the fact that in the past weeks at Fiji extremely large and extremely big earthquakes happened (both time over 8 magnitude and over 600 km deep) – I chose the Fiji islands for the International Day line horoscope. As you can see, the International Day Line has the New Moon on the ascendant, while the GMT based Horoscope shows the New Moon shortly before sunset. so what for humanity starts as an “I” theme, the theme of defining oneself, for the western world and its clock system it shows as a “you” problem or issue – as the “I” spot of Ascendant turns to the meeting and mating of the Decendent point in the Horoscope. A mirror theme – mirrored deending on cultures- can be seen in it. While the other planets form aspects with the nodes: Mars, Mercury, Venus, Chiron, Uranus, and the void of Lilith. So within the Energy of this new moon, there are only two sides of the story. Each planet is in either this side or the other part of it involved. there are no other energies or issues at work, but two main stories. One is a supporting energy of new moon – Neptun, Jupiter with Pluto. A boost in spiritual energy and intension / purpose throught Jupiter and Neptun, but also the danger of too much energy in illusion (Jupiter to boost, Neptun illusion). Pluto in sextile to Jupiter may be seen therefore as a refinement where the longing and the spiritual drive may boost too much into one direction, so he may be a corrector of energies that blow themselves up too much or have expanded too much in the past months. Mars Lilith shows an extreme meeting between the male energy and the first, archetypical woman, first wife of adam. An intensity of sexual drive in passionate complex relations with carmic ties unfold a deep attraction, almost hypnosis, pouring the carmic pattern into relation or separation. 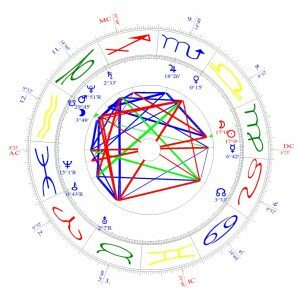 With Chiron linked to it this may touch the original wound, Uranus may show the real outburst of it, and venus shows in the square aspect that harmony may be lost. Words said may break the karmic relation. So there is a deep struggle to be seen on issues regarding male (mars) and female (Lilith/Venus) expression, no matter whether the female is the archetypical fierceful goddess in all her allmightyness or whether it is the harmonious esthetic one. With Uranus also in square, the tensions may show unexpected outburst of vast intensity and electricity. The other planets, Saturn, Chiron, Mercury, are soothing or adding to this. Saturn in Trine with Uranus shows a sudden impuls for the right structure or the right issue, the right ethic, the right wisdom in action, while Chiron in Square with Saturn may show the pain of such a structure, as the wound would rather be healed with the relation, not the structure. Mercury is in a trine aspect with Uranus, Uranus as the higher octave of mercury, yet mercury has left the trine and is leaving the close aspect. Messenger, as he is, is already on his way to deliver it, ad it is also the message of a healing structure and mental plan, as he is in a great trine. So Mercury Uranus and Saturn form a helping earth-related trine to manifest and focus words, actions, energies and inspiration with structure. While at the same time these inspirations may be roughly disruptive to all sorts of relations between the sexes. on the more global level we may see a stress on financial issues (venus), wargames(Mars) and sudden outbreaks of financial threats or wars. as Lilith belong to the land of “Ur”, there may be a focus on Iran/Irak/Syria /Turkey area, the former paradise region around Euphrat, Tigris and Babylon. 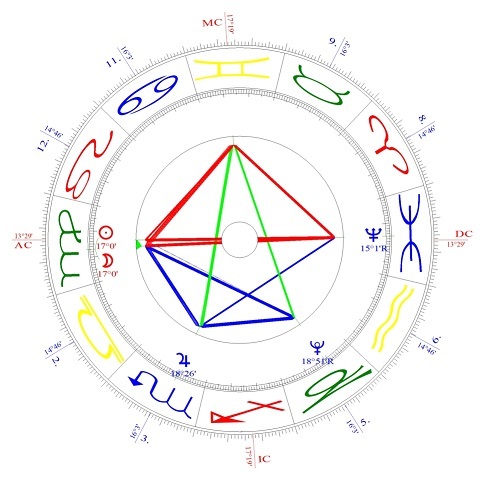 Neptun in opposition with the new moon shows the likelihodd of issues regarding floods, oceans, landslides or crude oil. Yet due to the fact, that a new moon is a sign of new beginnings, this may also mean the new beginning of all issues relating to floods, to the waters of the worlds, and to crude oil. may the stars shine your path, and may the star you are guide your way. As above, so below – right? When starting to explore the spiritual realm, one quite often thinks Politics may not be spiritual. Sometimes, people even start to walk the spiritual path or look behind the veils as they are disillusioned by the every day life. Fake news, Fact checks, conspiracies and mob mentality and raids may rise in the upcoming election time in America, therefore flood the social media realm. But what is politics. What is the root, the foundation of it? During my study in political science I got aware how often what had inspired me on the spiritual realm was rooting in the ancient philosophies, thinkers that have expanded consciousness on earth throughout the ages. I found esoteric ideas and the pondering on what the soul means in their readings – and – interesting enough – they also wrote on politics. The root of the word Politic is Polis – which meant the town or community one lives in. The people one lives together with. In the spiritual world, people seek their soul family or soul tribe, a place where to live amongst others that feel the same, have the same view. In some traditions this is called an Ashram, other call it Sangha.